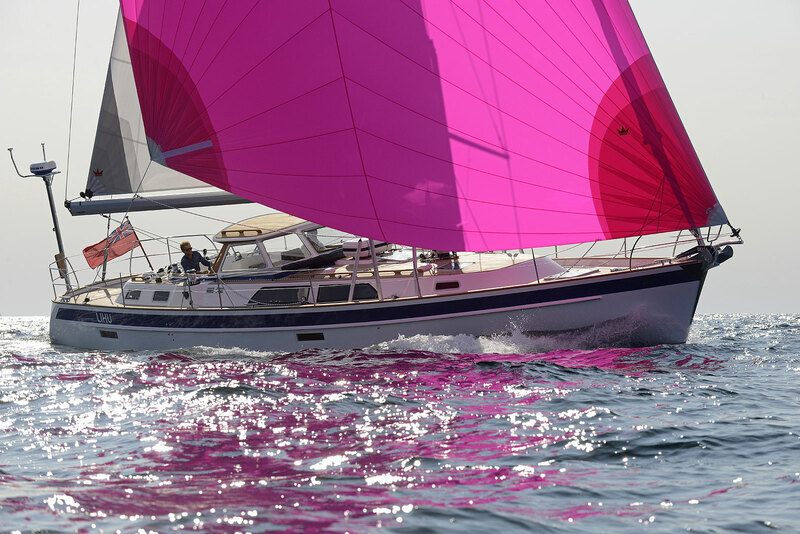 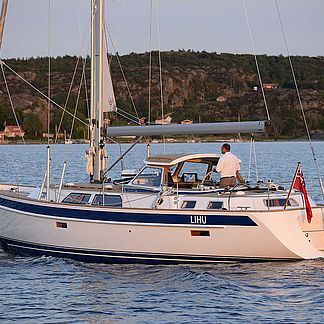 "MORE NATURAL LIGHT - MORE COMFORT - MORE ELEGANCE"
The Hallberg-Rassy 48 Mk II is new for model year 2014 and offers More natural light - More comfort - More elegance - She is even More Hallberg-Rassy! 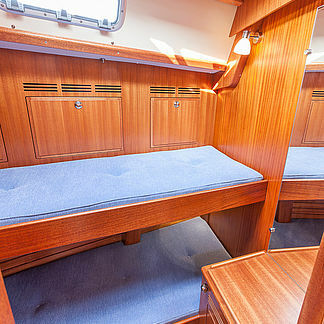 The saloon portlights are a heritage of the Hallberg-Rassy 55 and 64. 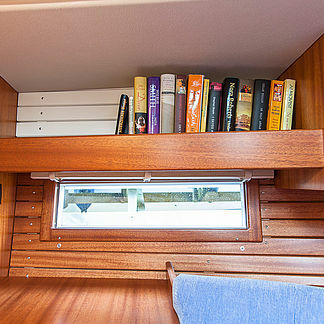 The window area is greater and is frameless with tempered glass. 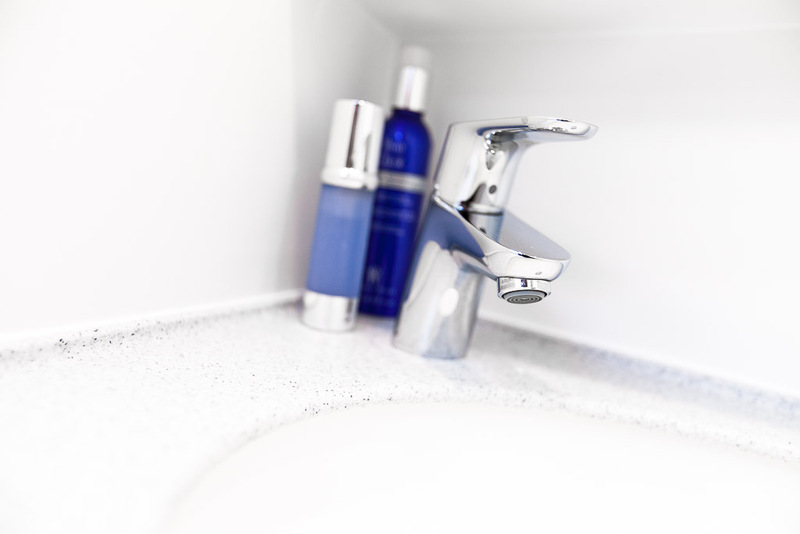 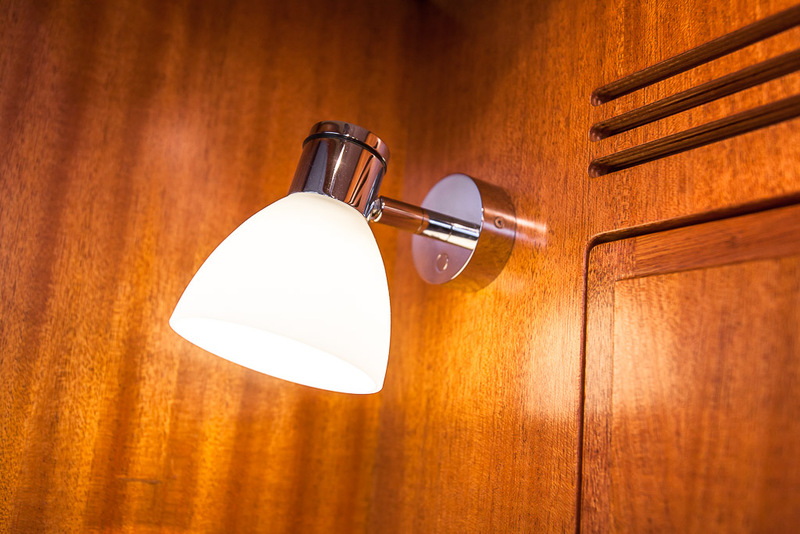 This gives both more natural light and more elegance. 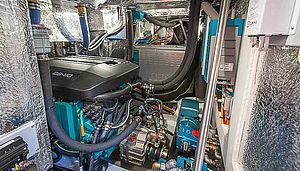 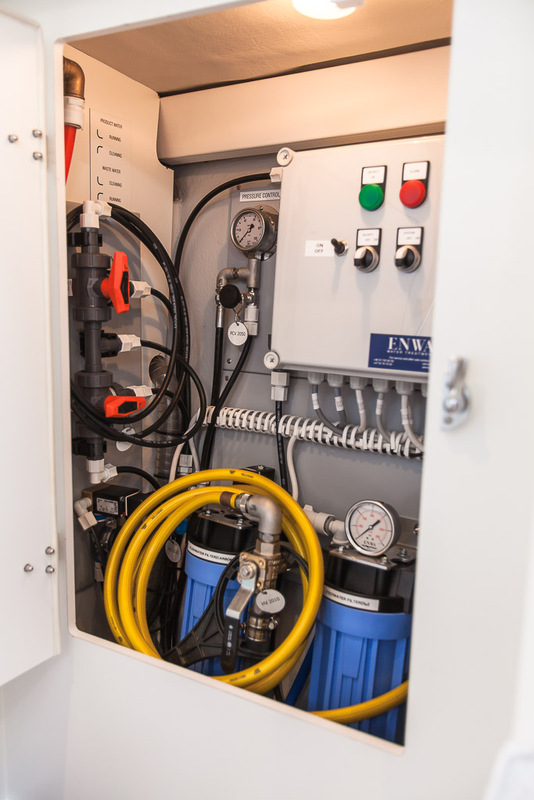 The engine is a state of the art Volvo Penta, an efficient 5 cylinder with common rail technology and 20 valves. 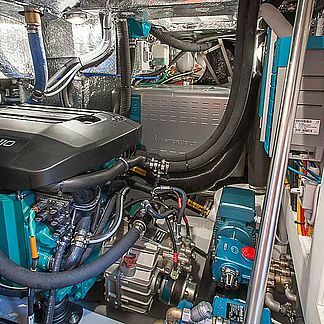 The Volvo Penta D3-110 develops 81 kW/110 HP. 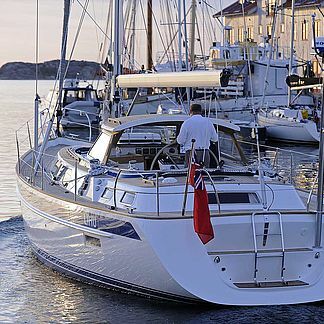 Maximum torque is as much as 342 Nm at just 2000 RPM. 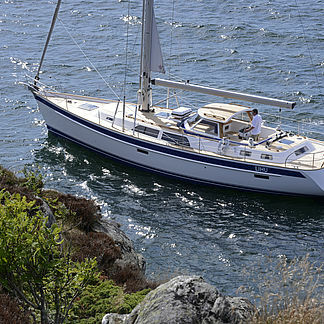 That is the perfect engine for a displacement cruiser like this. 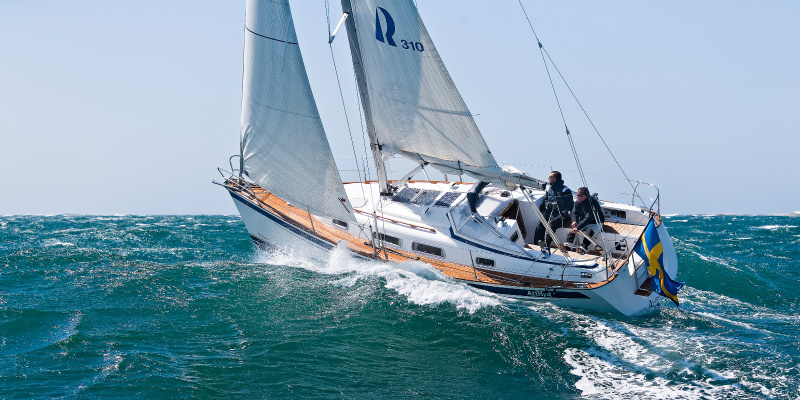 You don't really use your horse power but you your torque, at low RPM. 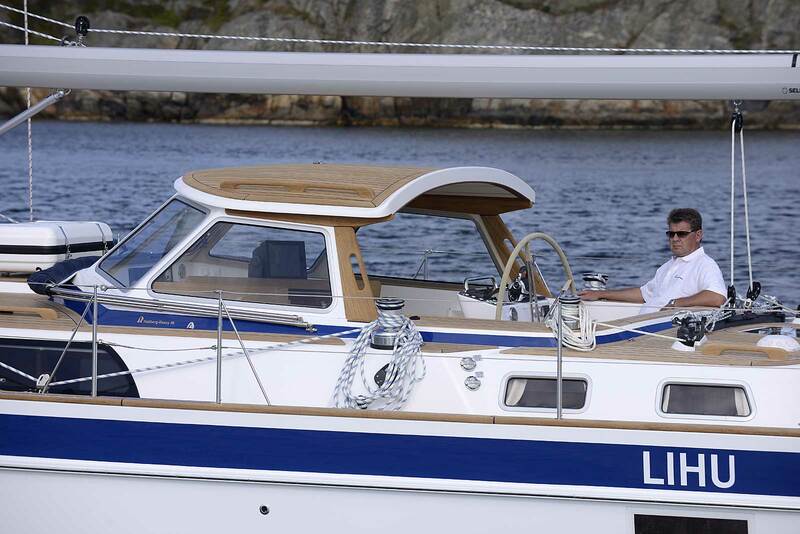 That is why you need a modern engine with high torque at low RPM. 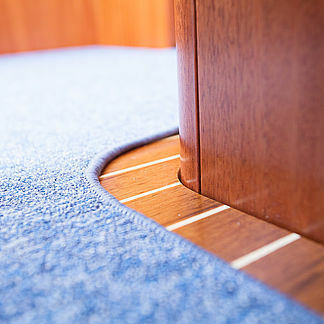 That gives comfortable power, low noise and low vibrations. 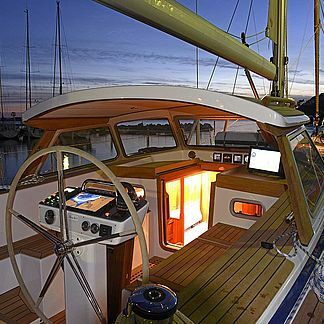 That is comfort! 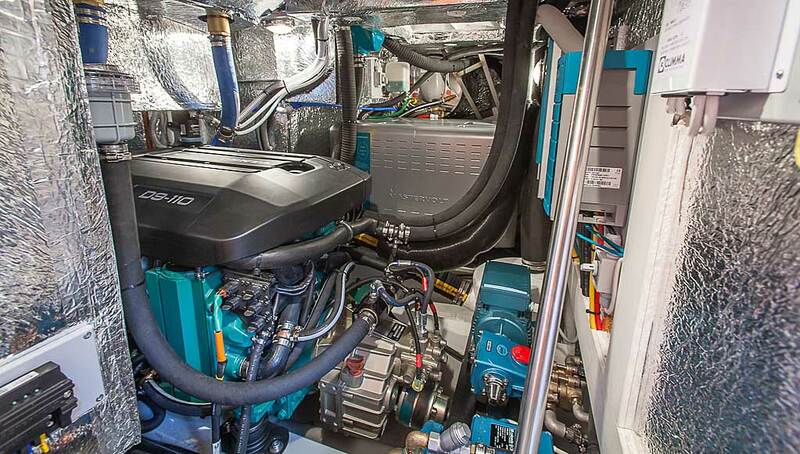 The fuel tank capacity of the 48 is as much as 800 litres. 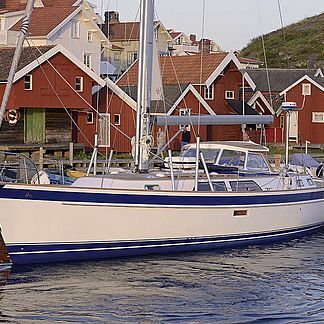 This modern engine combined with an overdrive propeller from Gori gives a range of 1 060 Nautical Miles, that's roughly from Hamburg in Germany to Iceland, motoring non-stop! 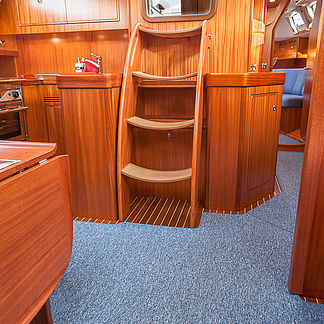 That is what you need for a contemporary Blue Water Cruiser. 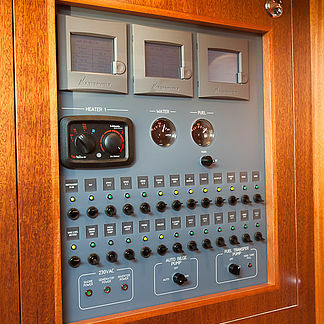 The standard equipment list is rather extensive. 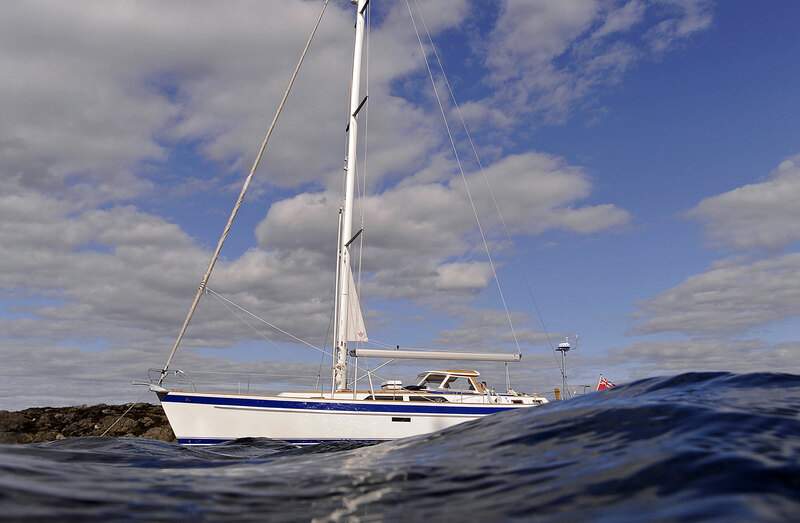 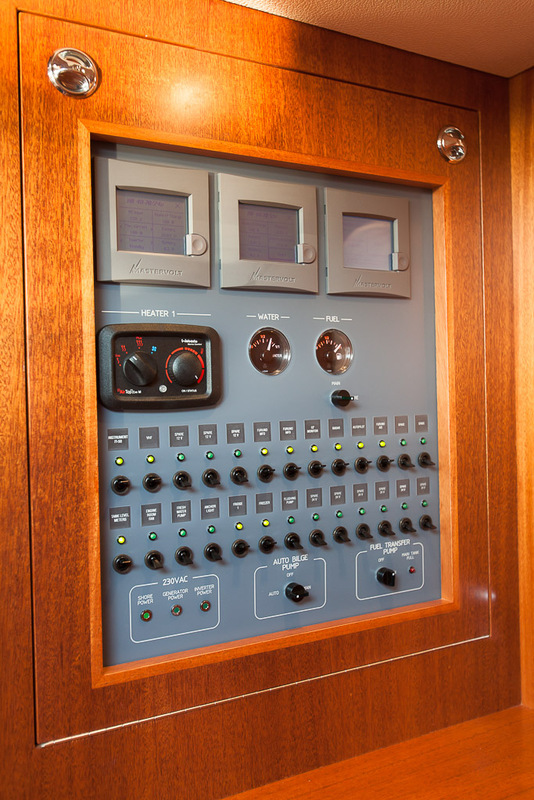 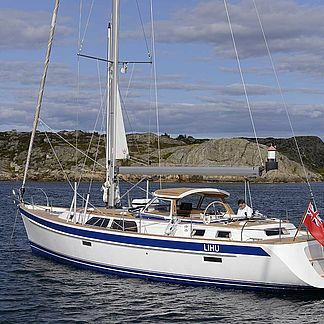 For example Raymarine Speed, Depth and Wind as well as two holding tanks are included in the Hallberg-Rassy 48 Mk II. 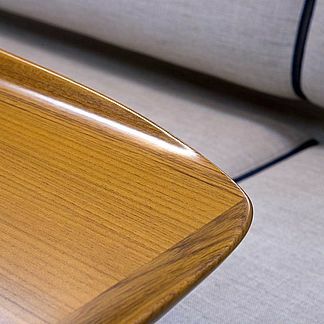 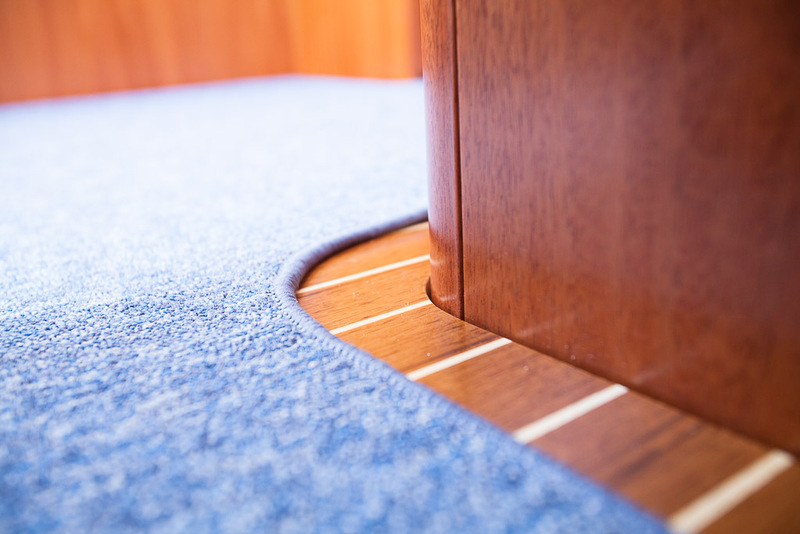 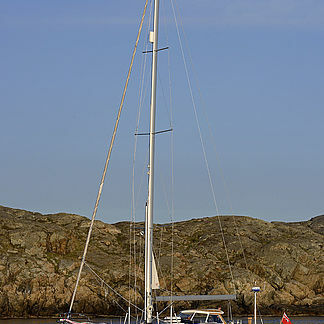 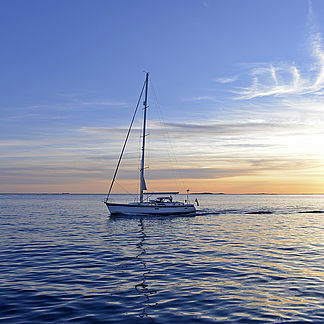 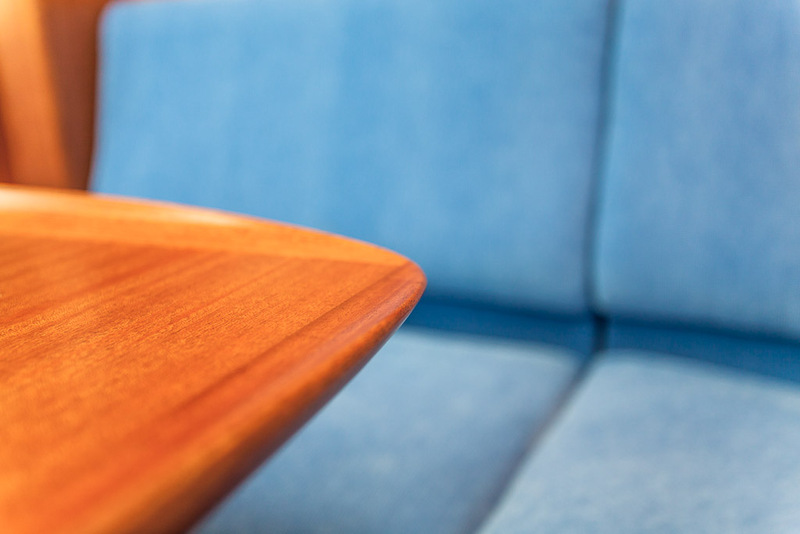 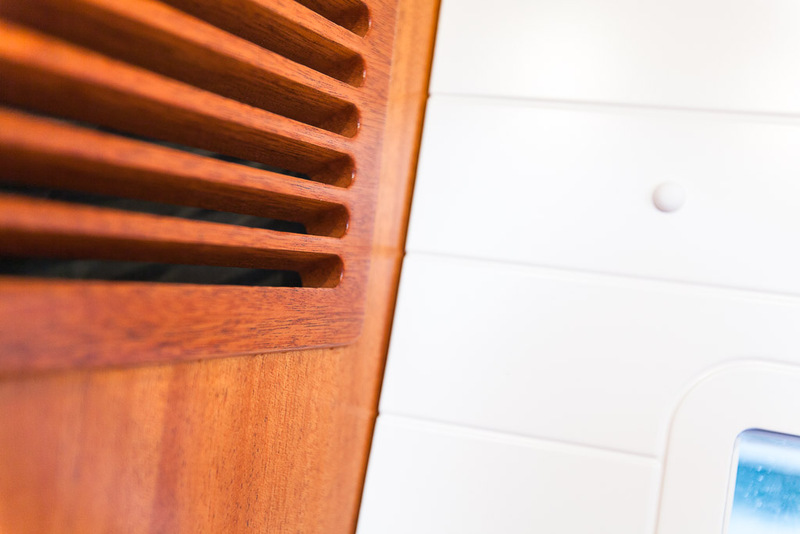 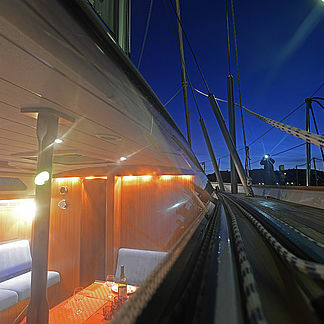 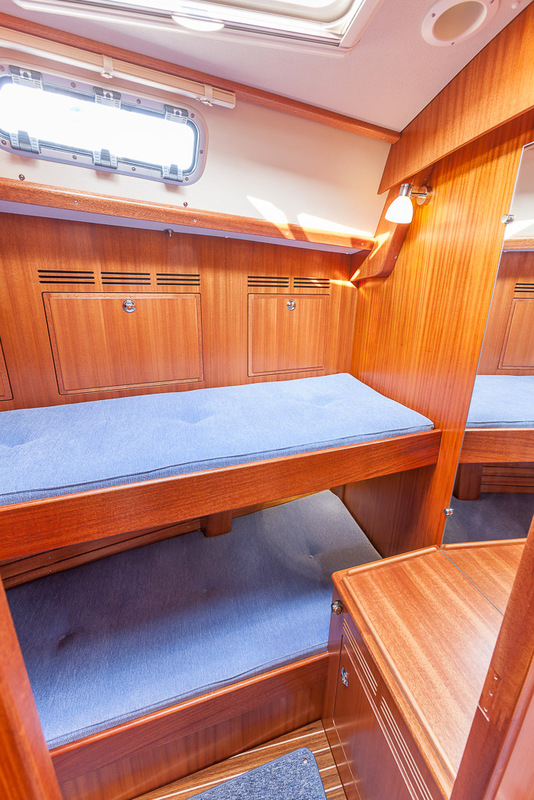 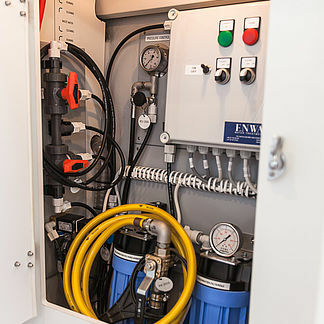 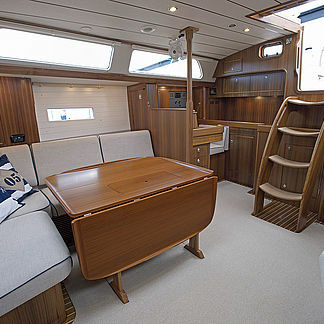 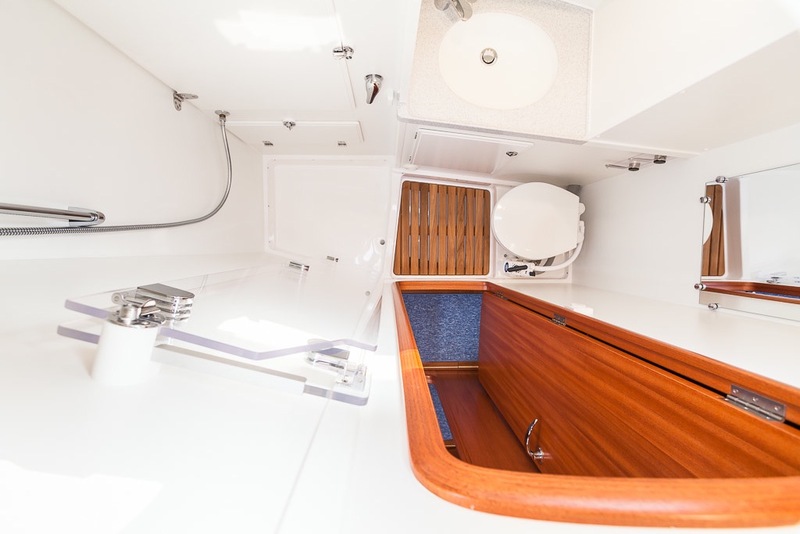 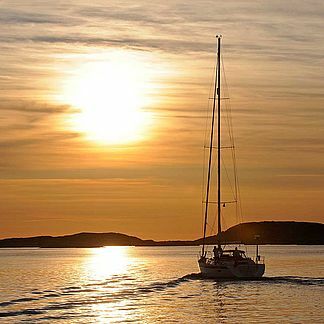 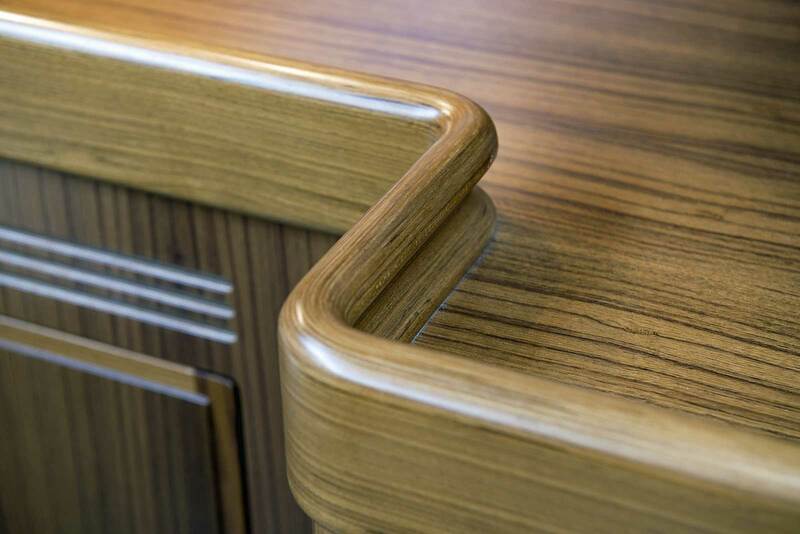 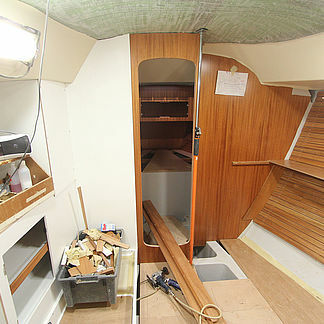 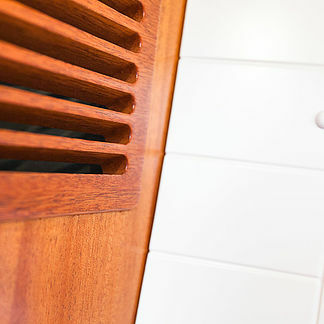 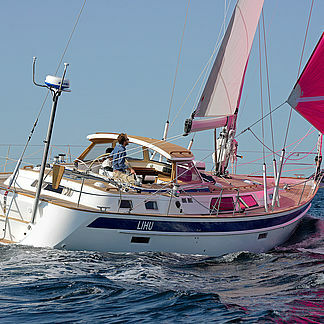 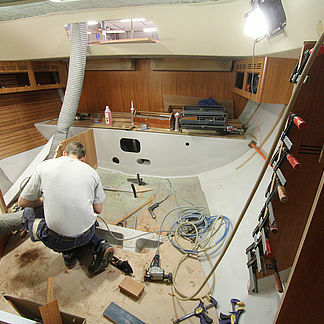 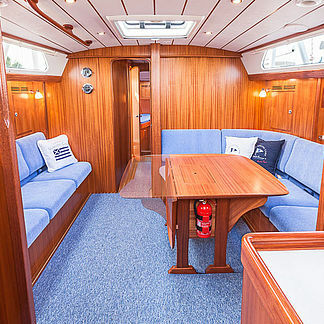 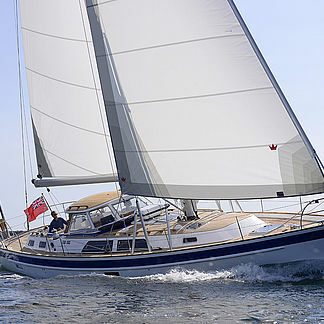 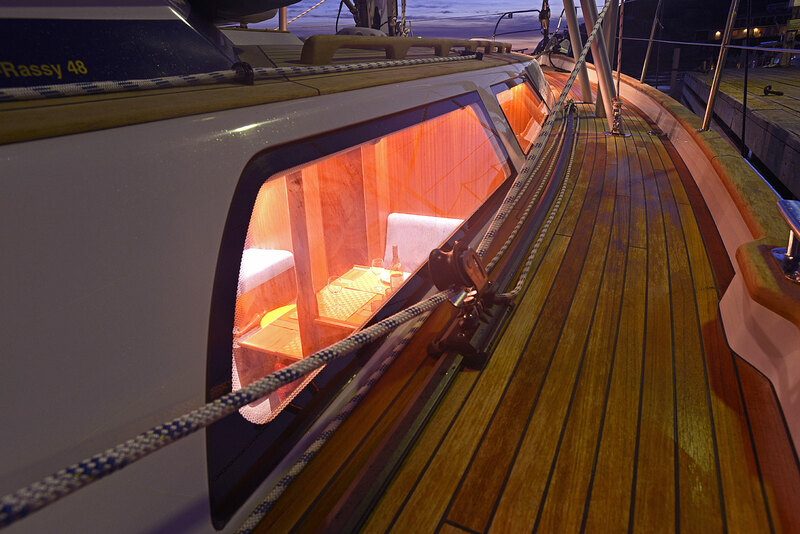 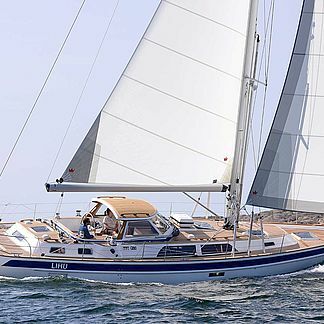 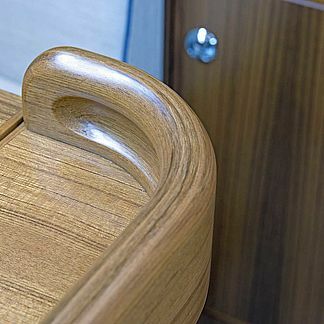 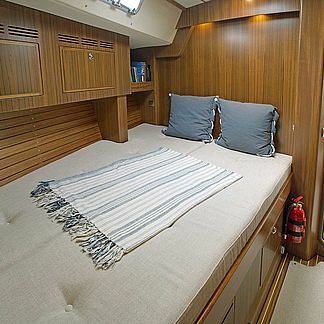 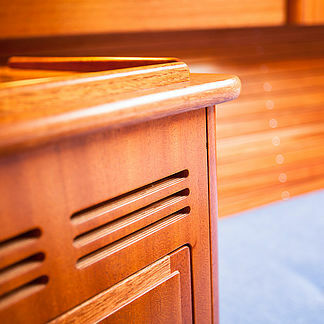 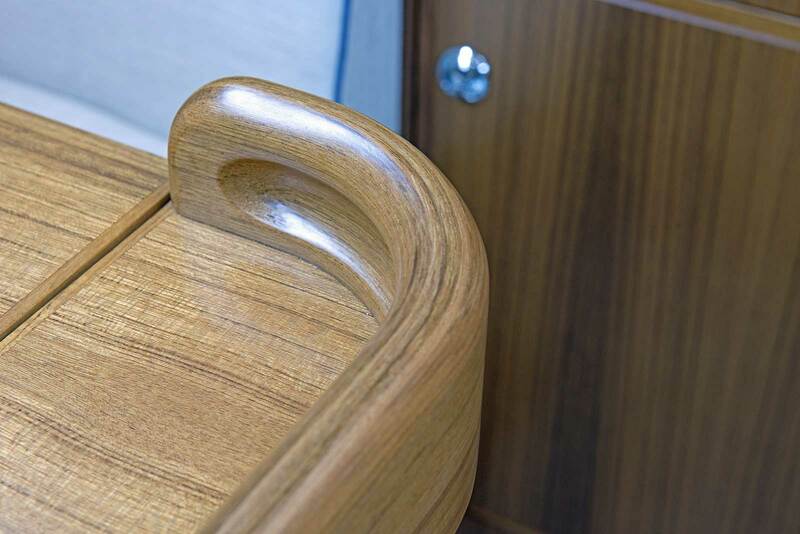 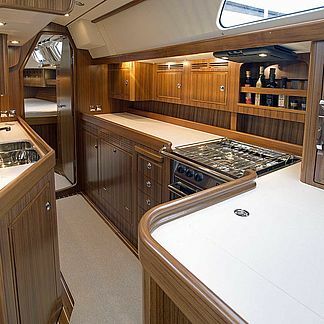 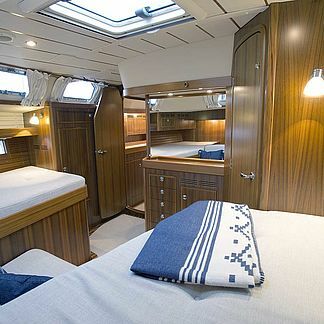 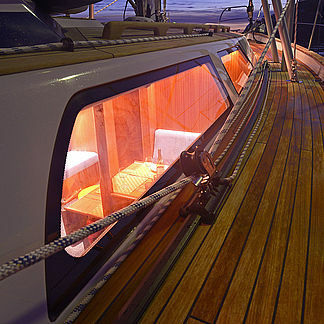 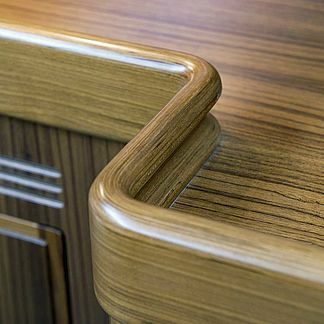 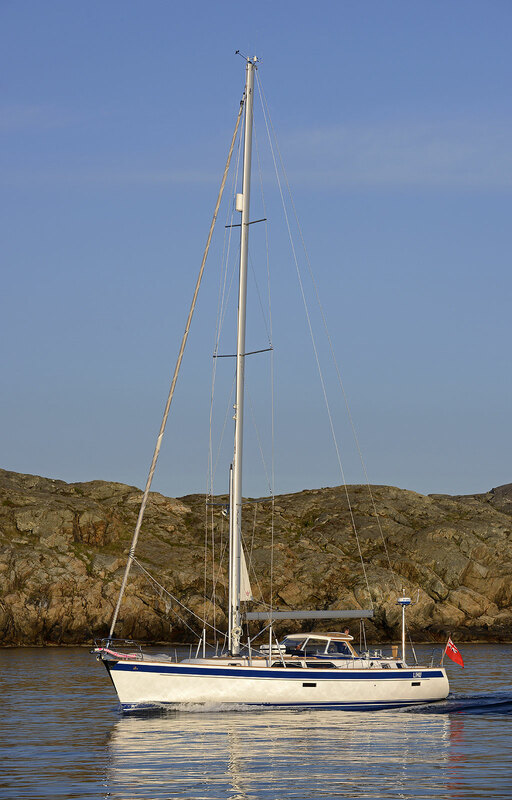 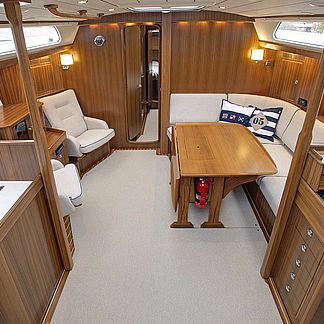 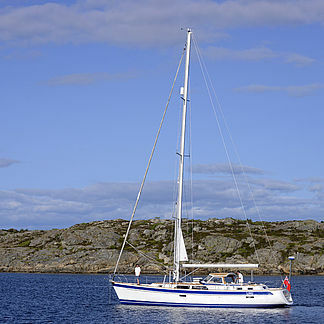 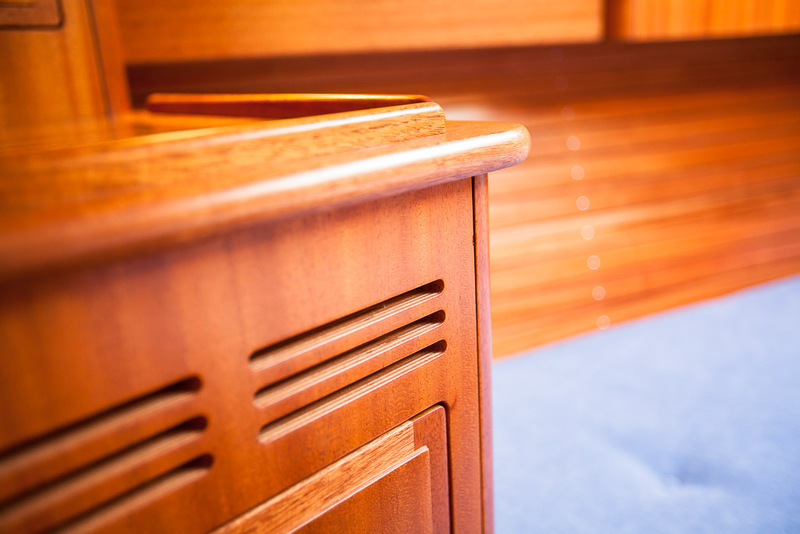 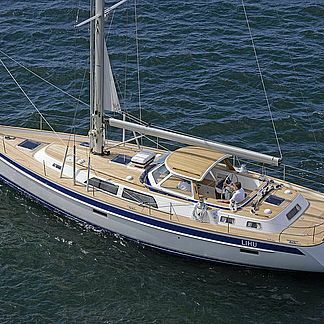 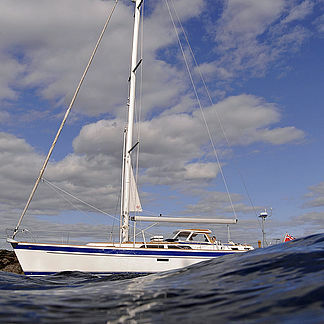 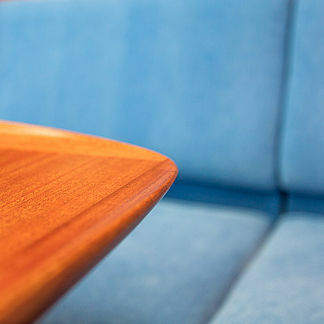 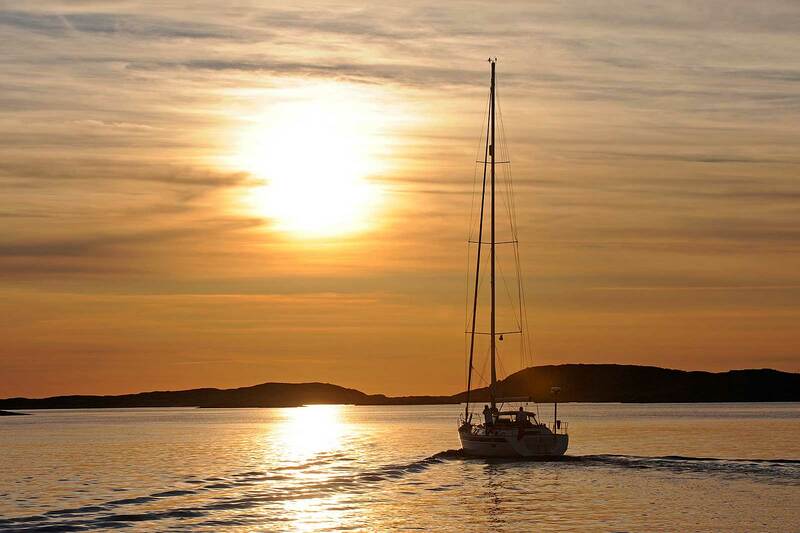 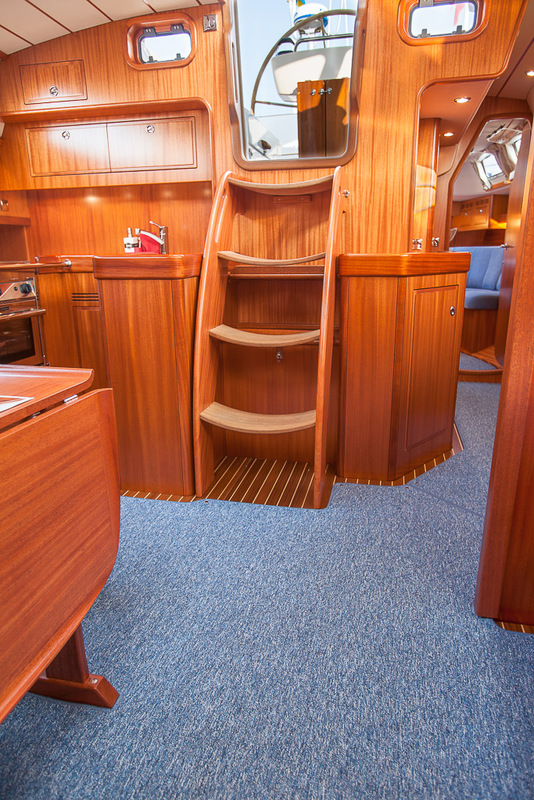 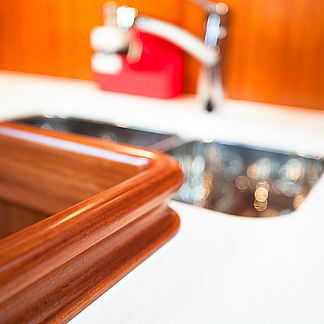 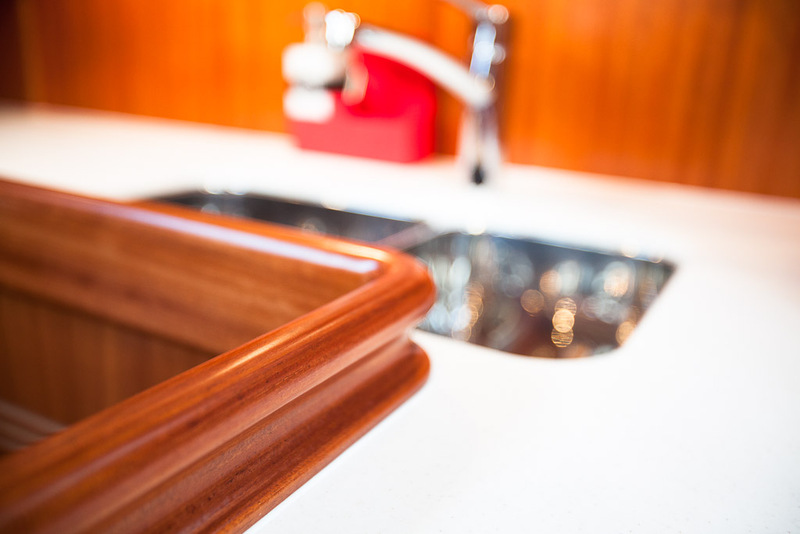 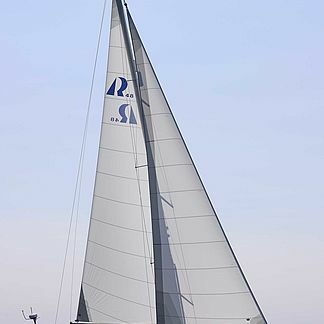 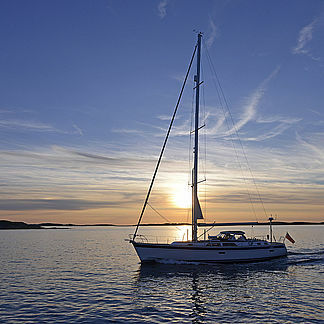 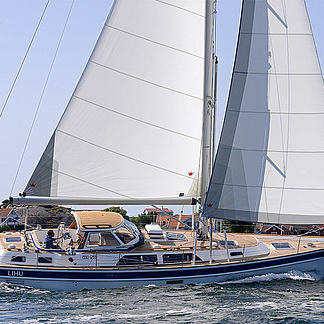 Items such as teak on deck and coachroof, electric windlass with Delta anchor and chain, twin heaters with insulated hoses, fridge compressor, antifouling, high gloss varnished teak table on steering pedestal, mainsail and furling jib, wind screen with tempered glass, and a lot more, are examples of the extensive standard equipment. 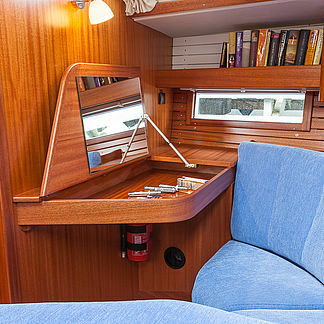 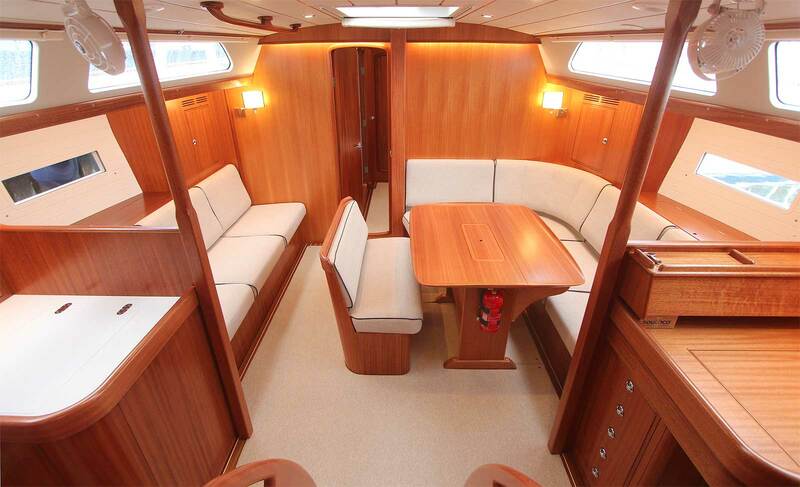 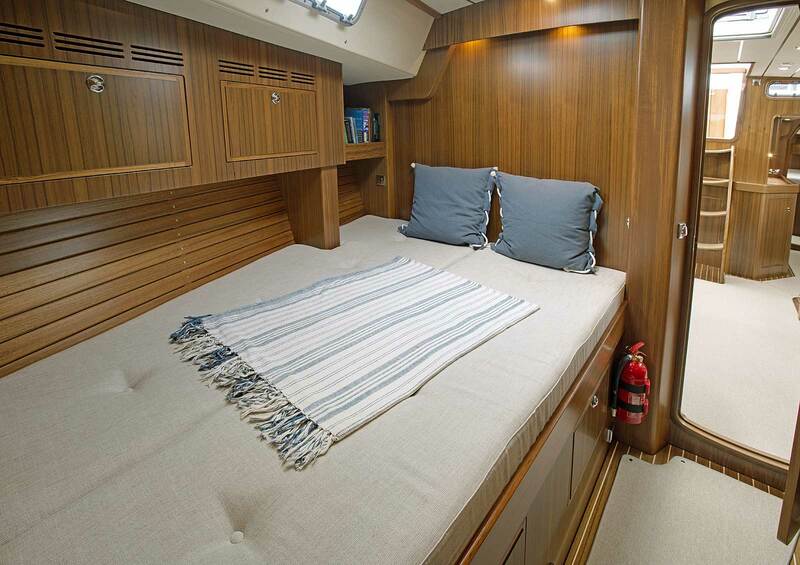 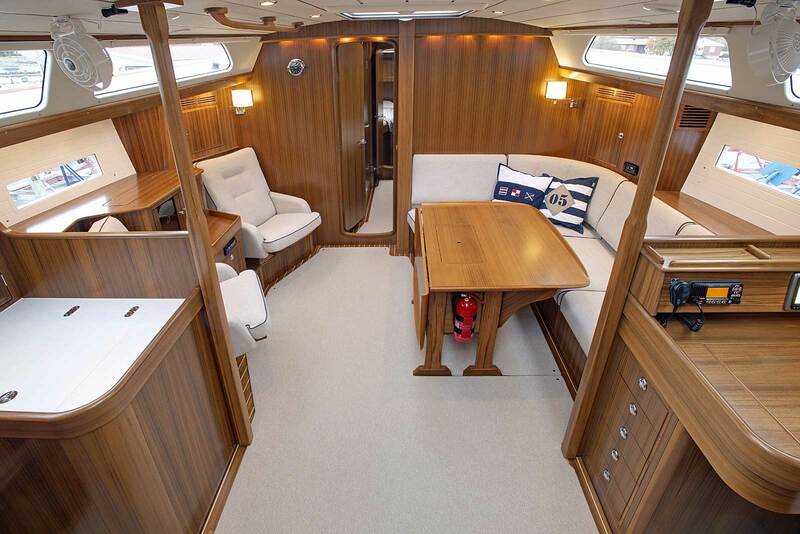 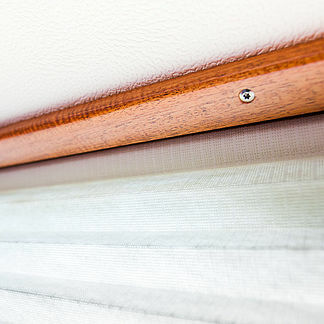 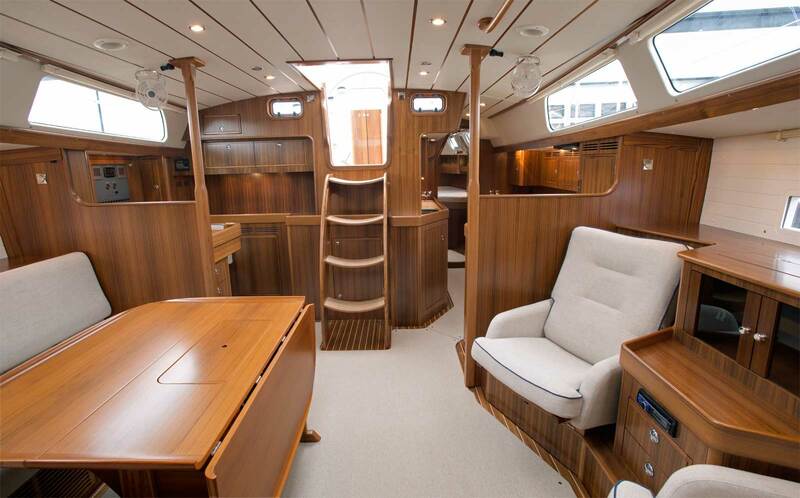 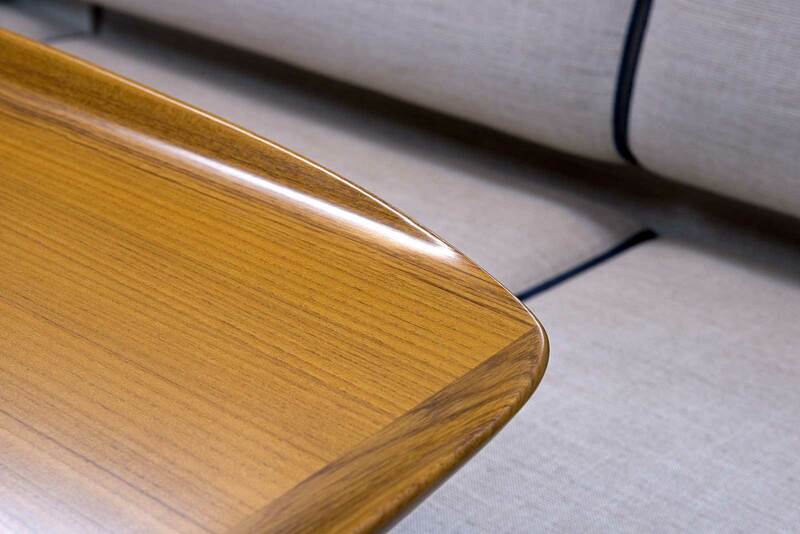 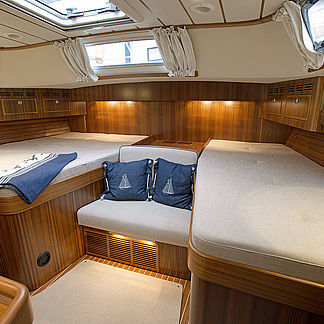 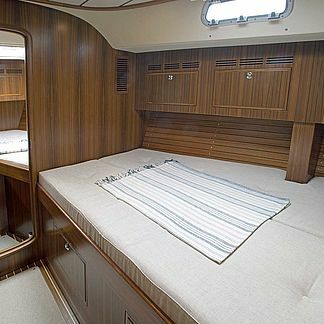 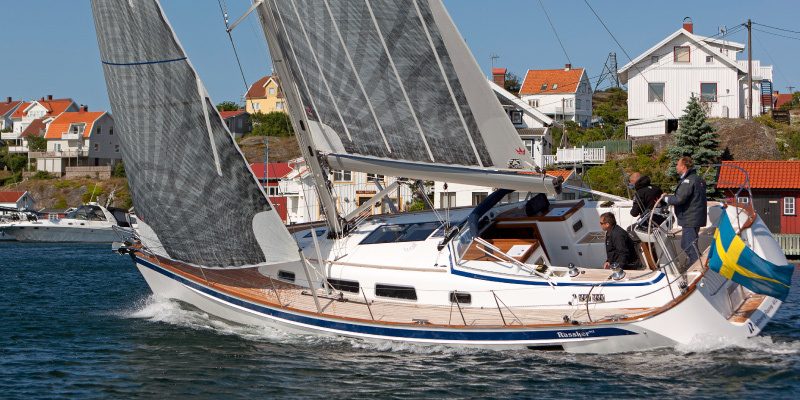 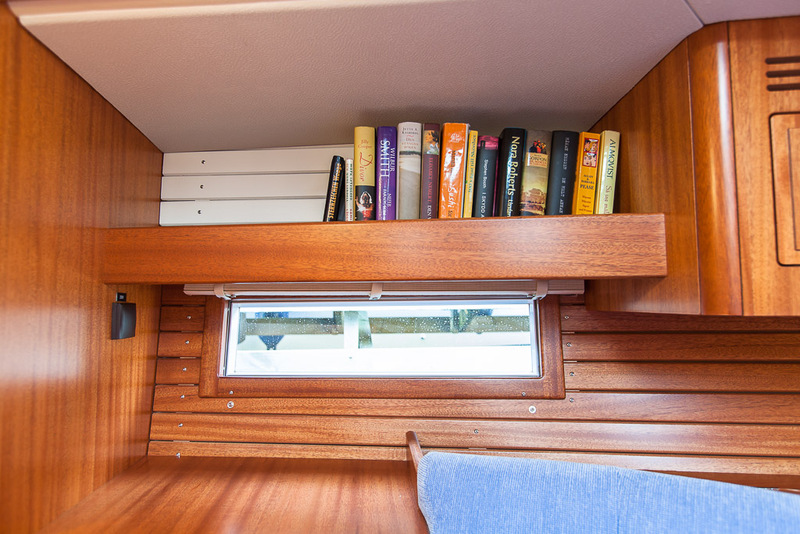 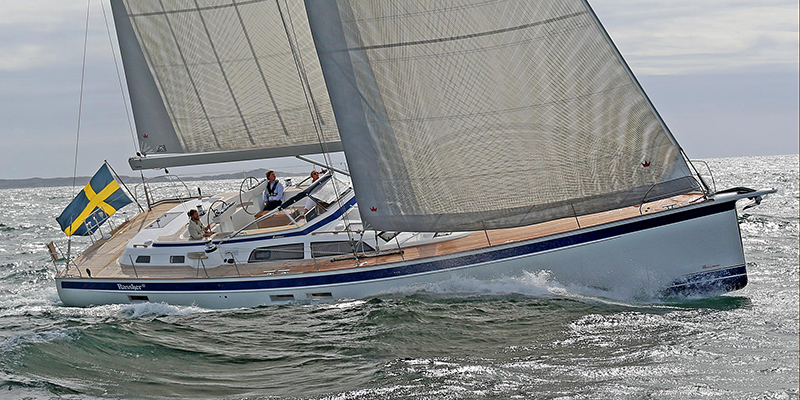 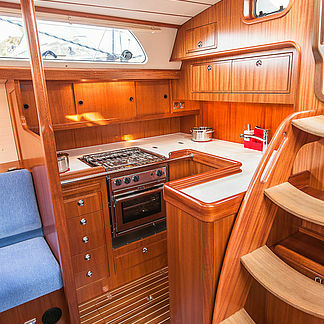 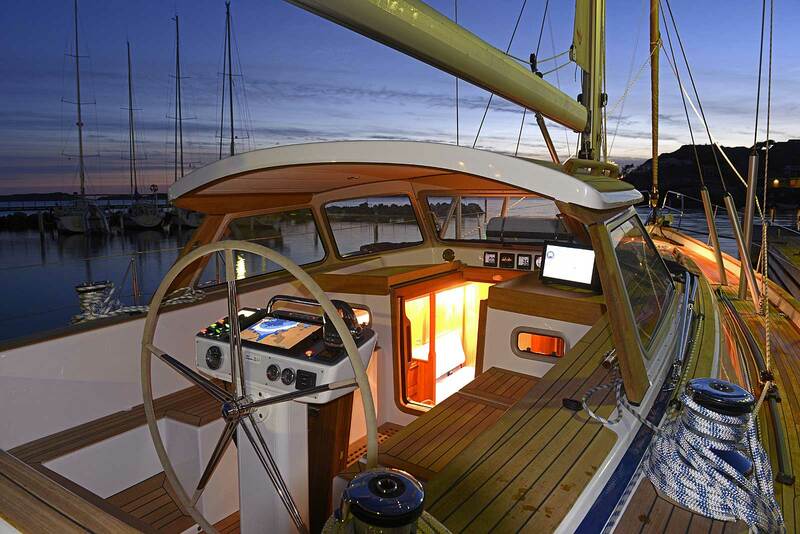 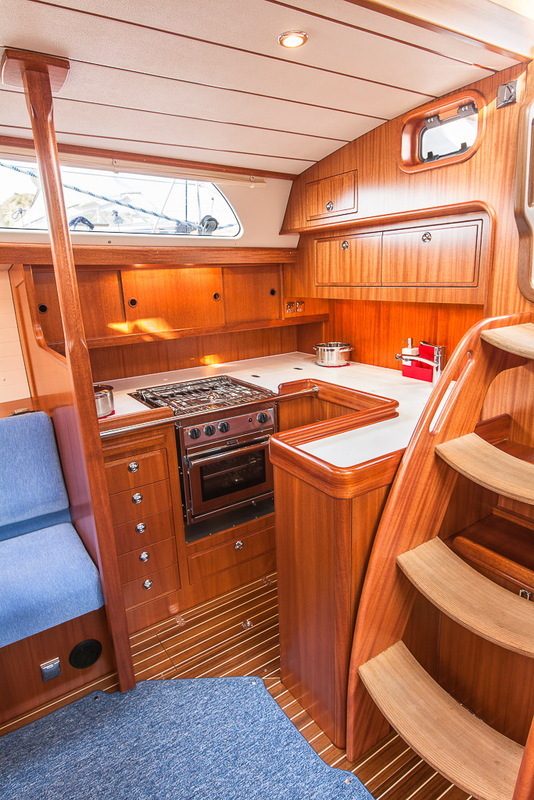 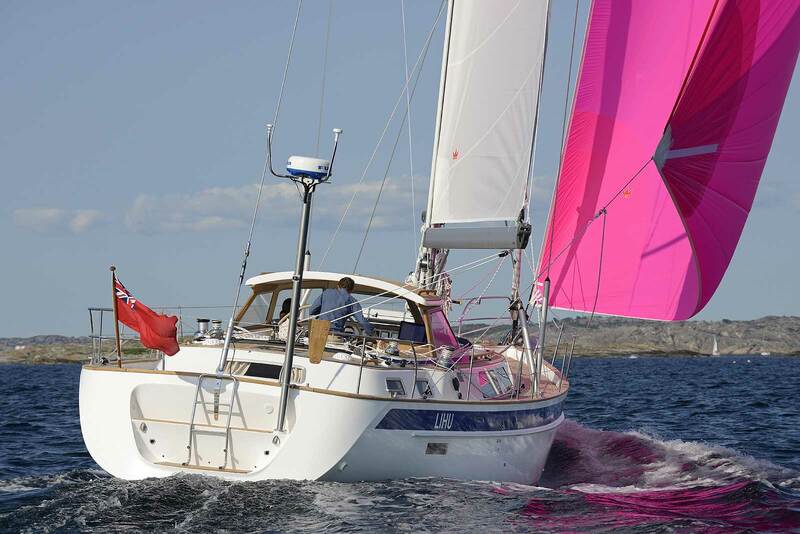 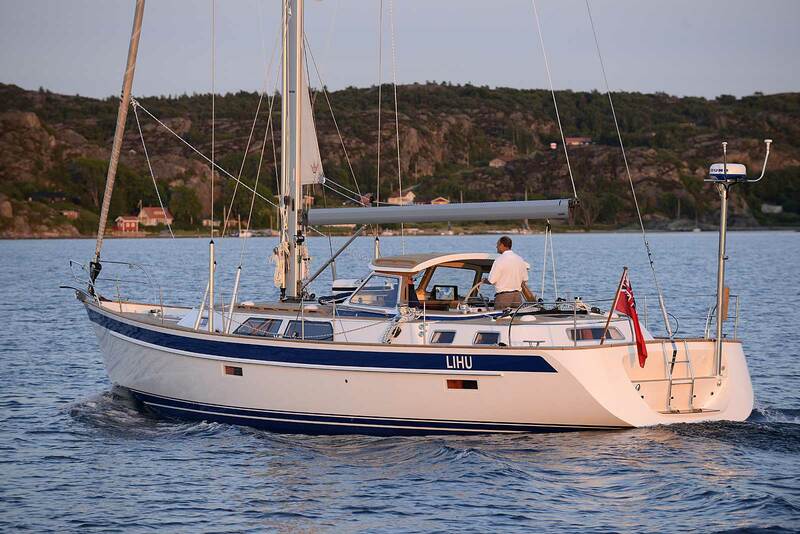 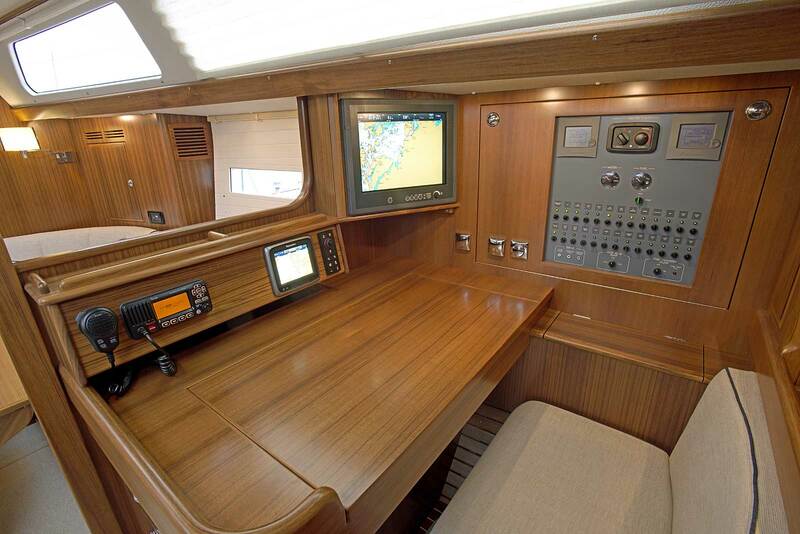 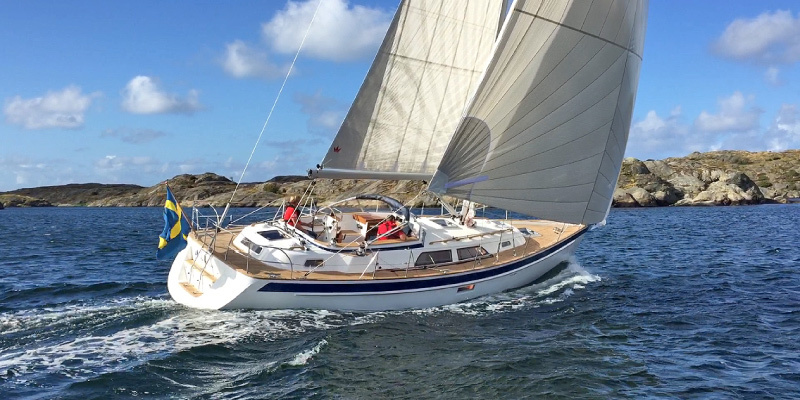 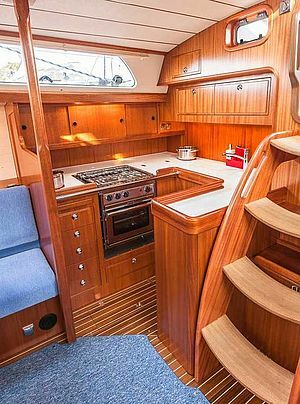 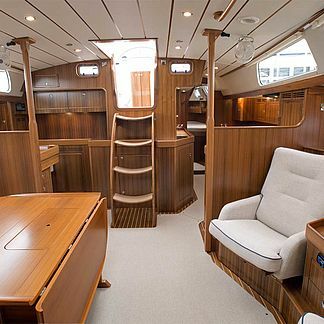 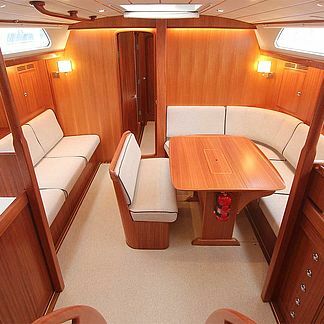 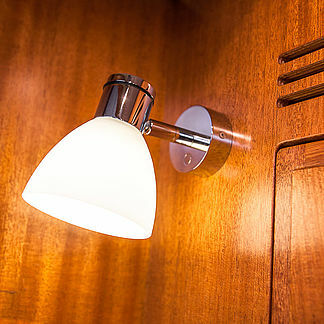 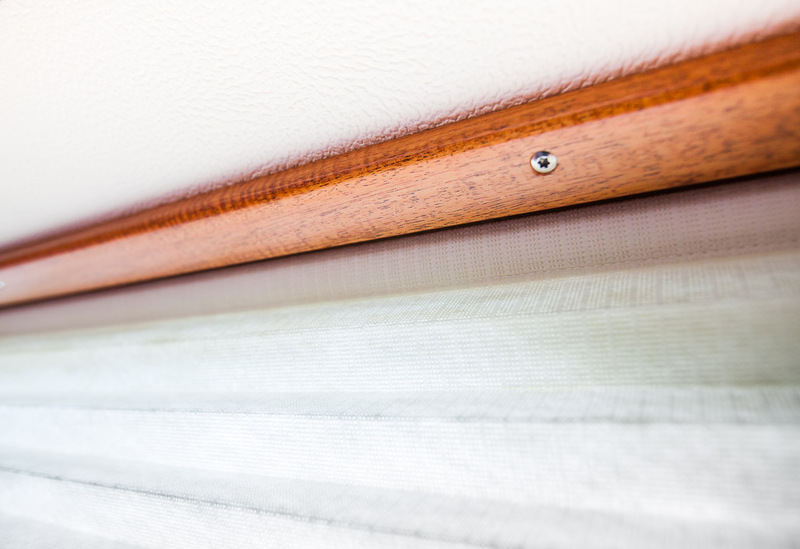 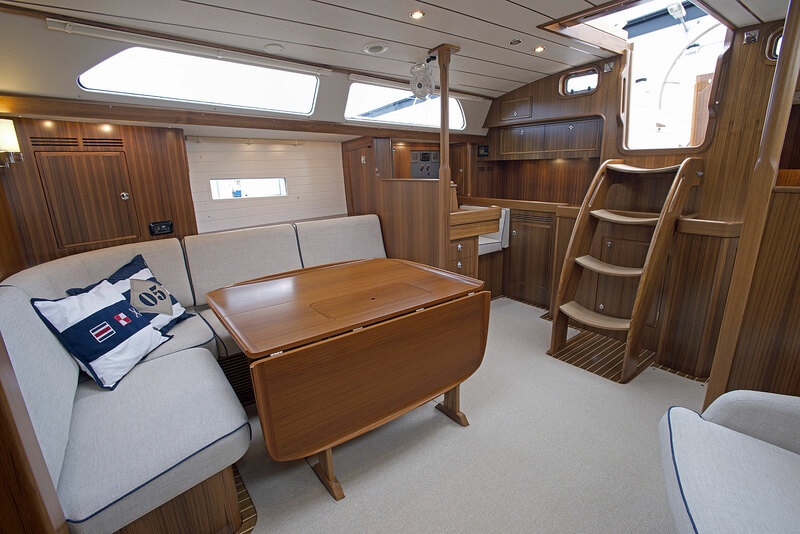 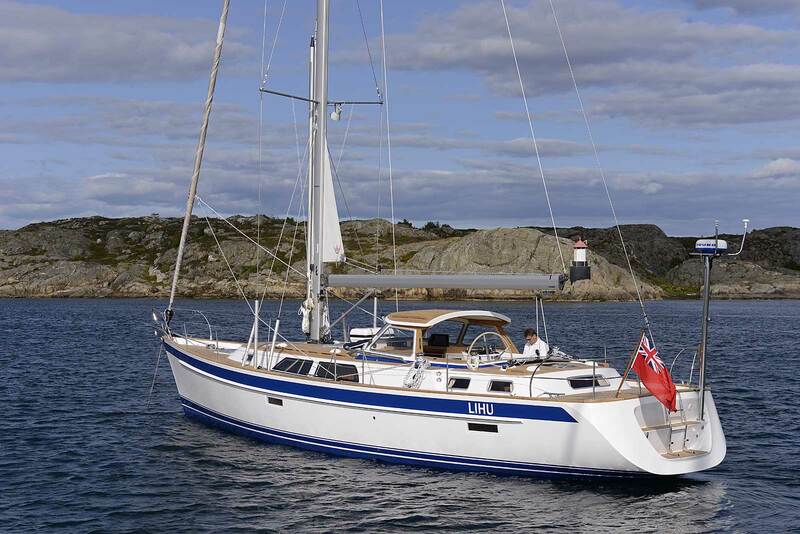 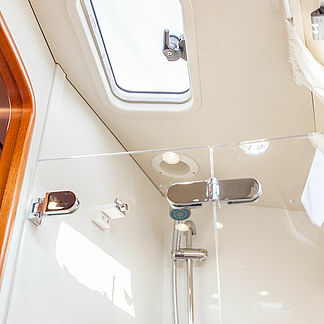 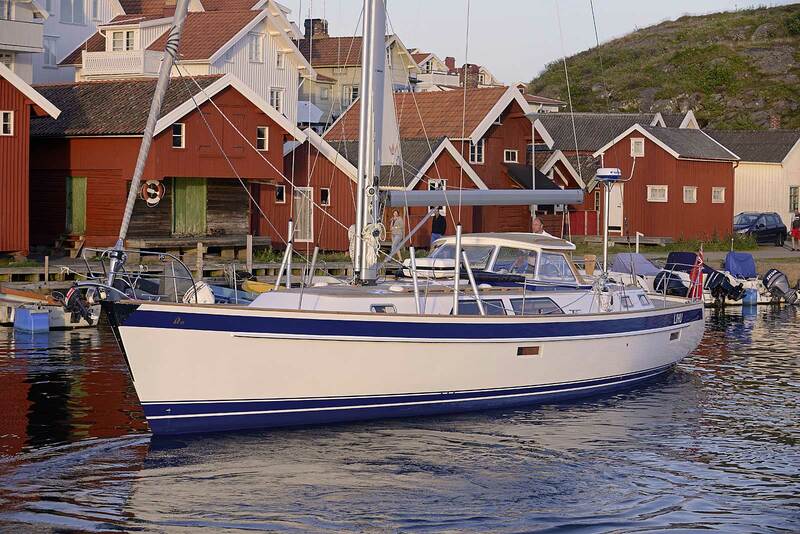 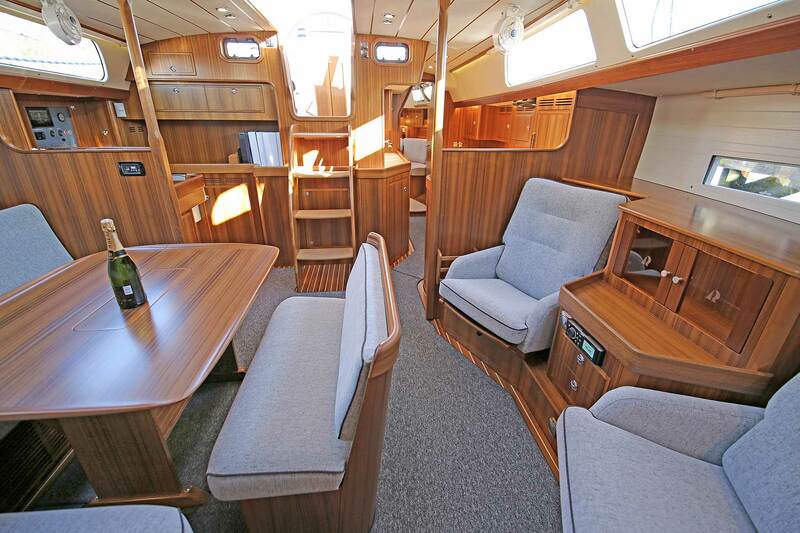 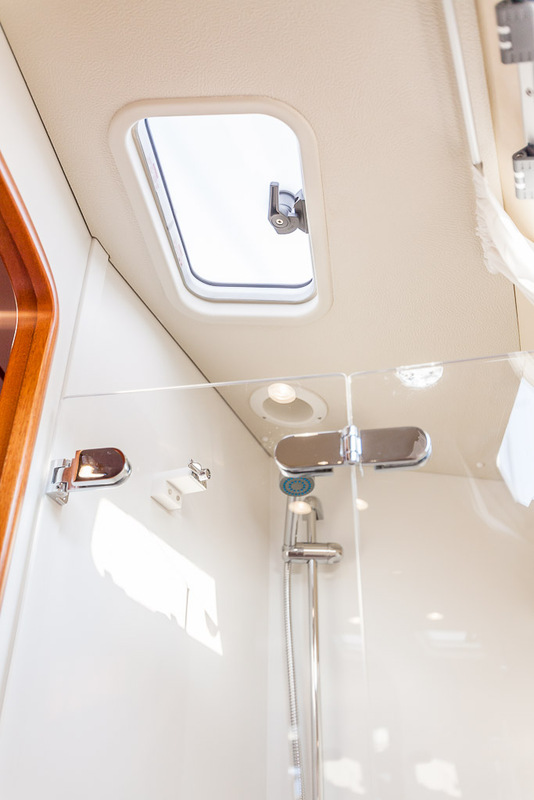 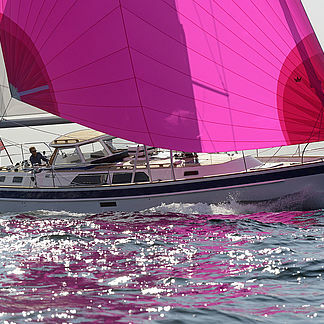 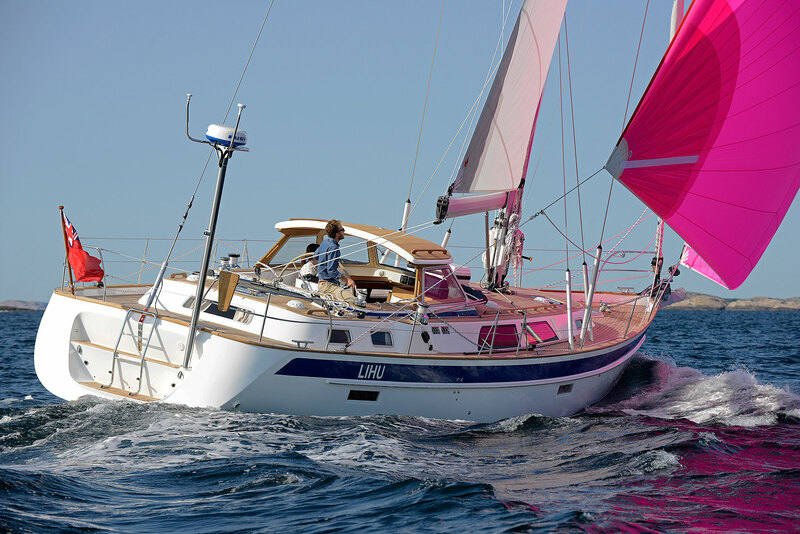 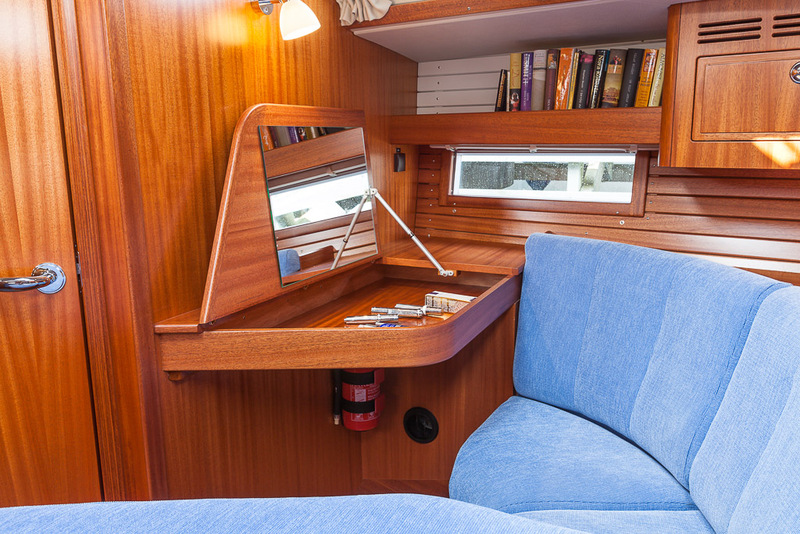 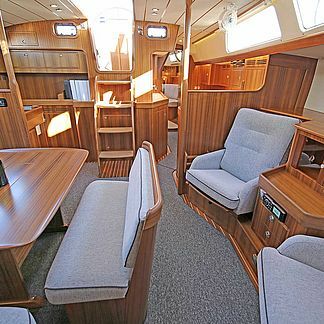 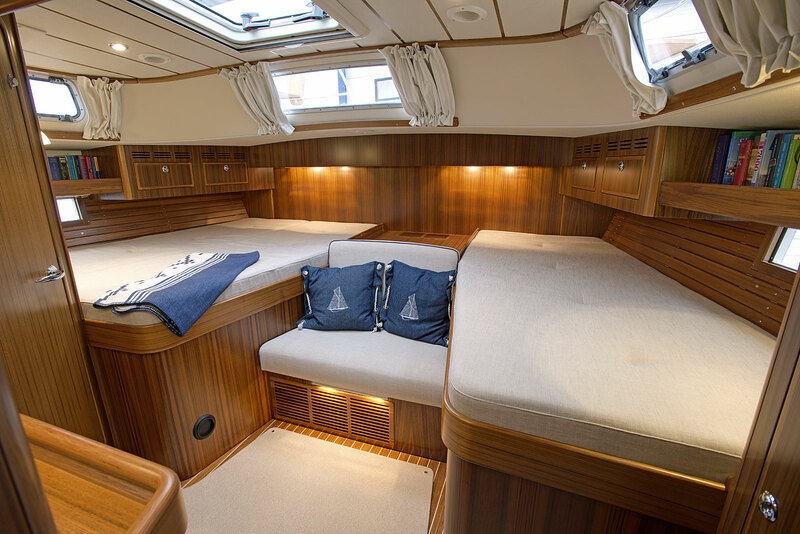 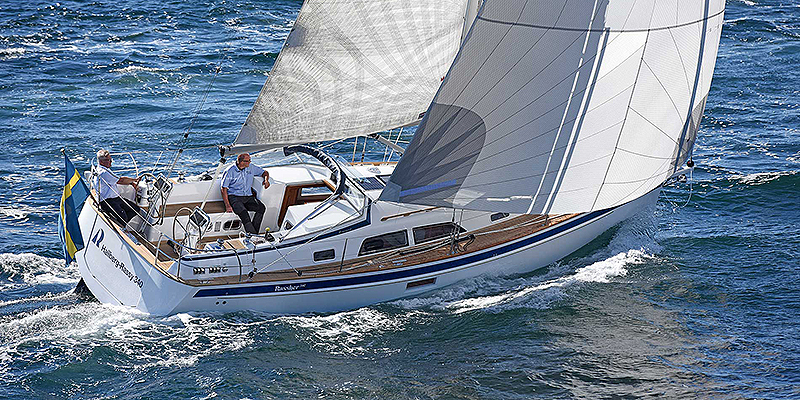 Hallberg-Rassy 48 Mk II gives more natural light, more comfort and more elegance. 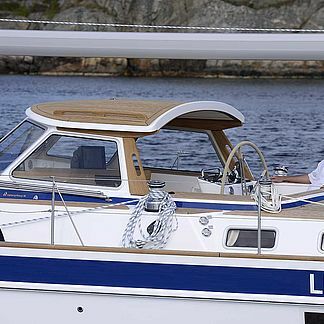 She develops an already successful concept. 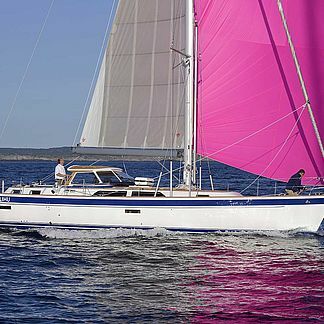 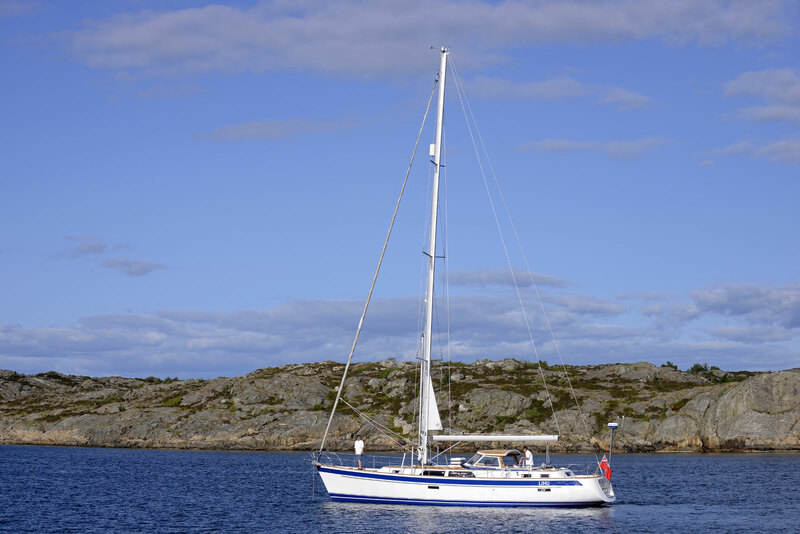 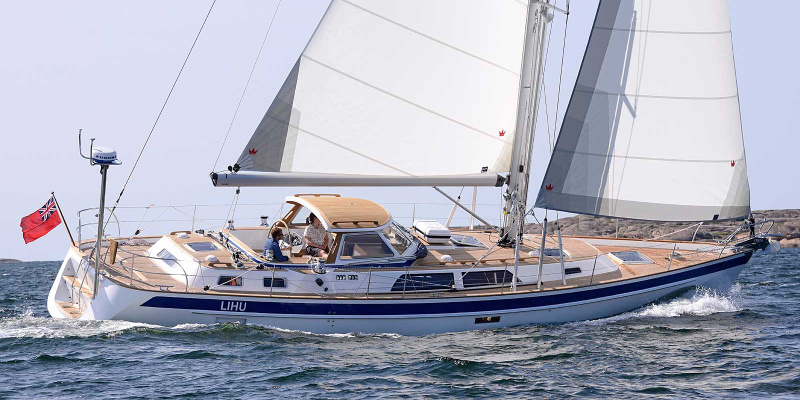 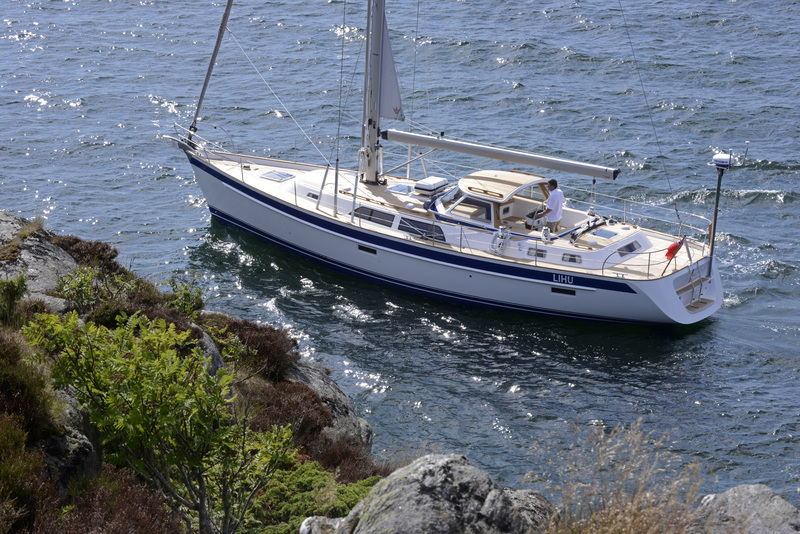 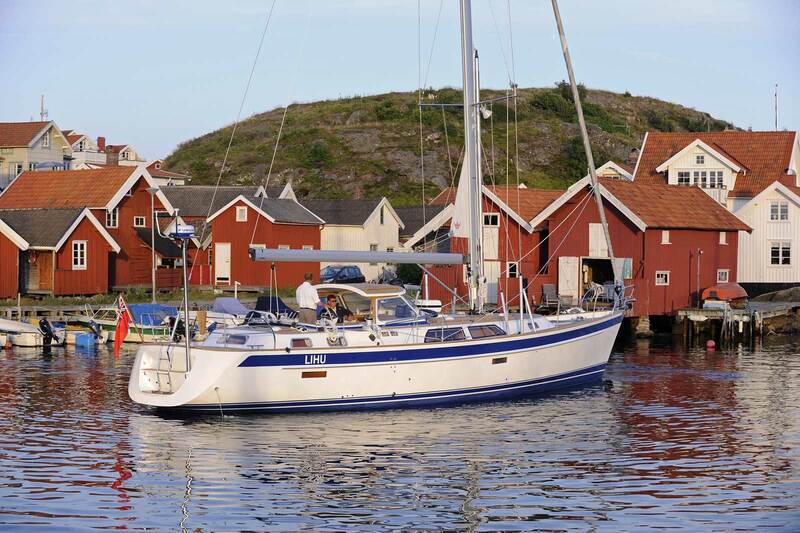 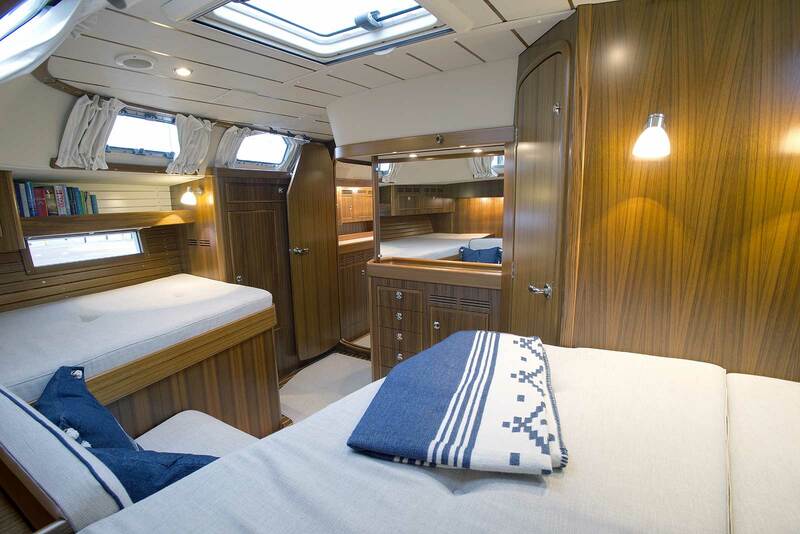 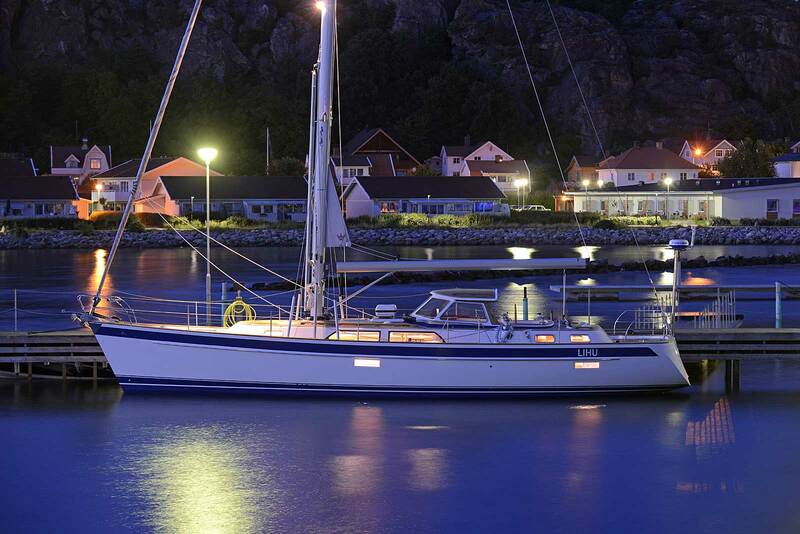 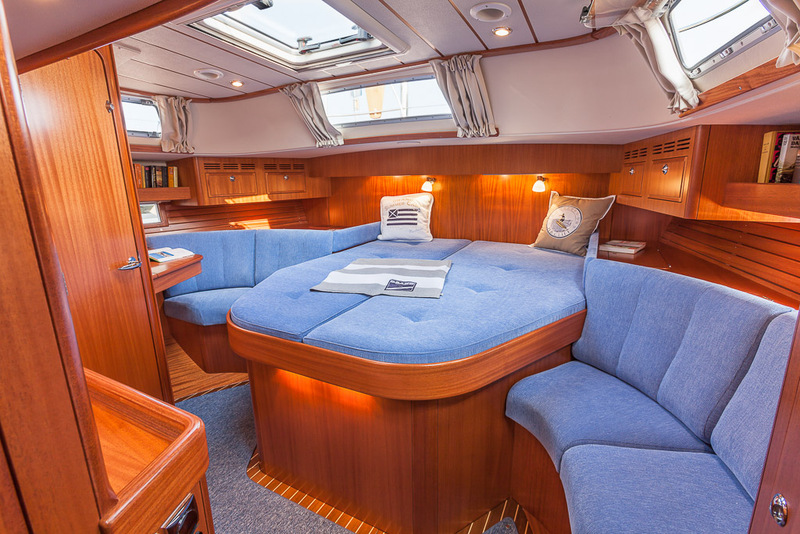 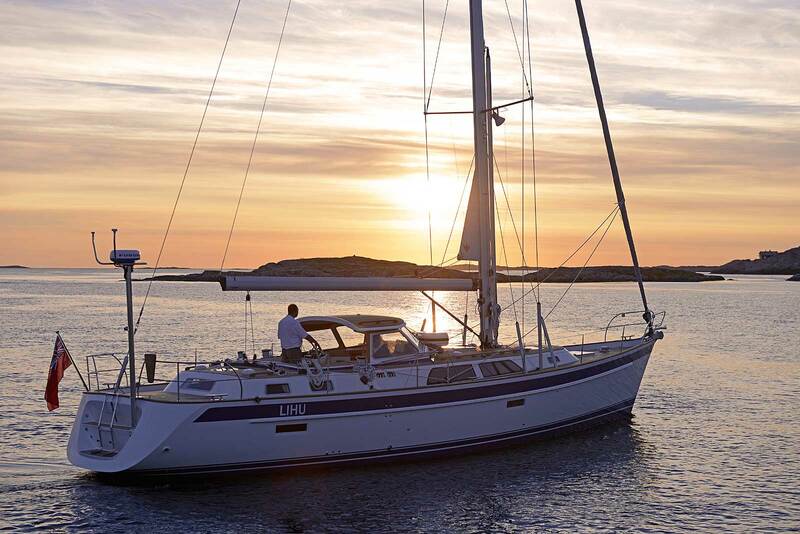 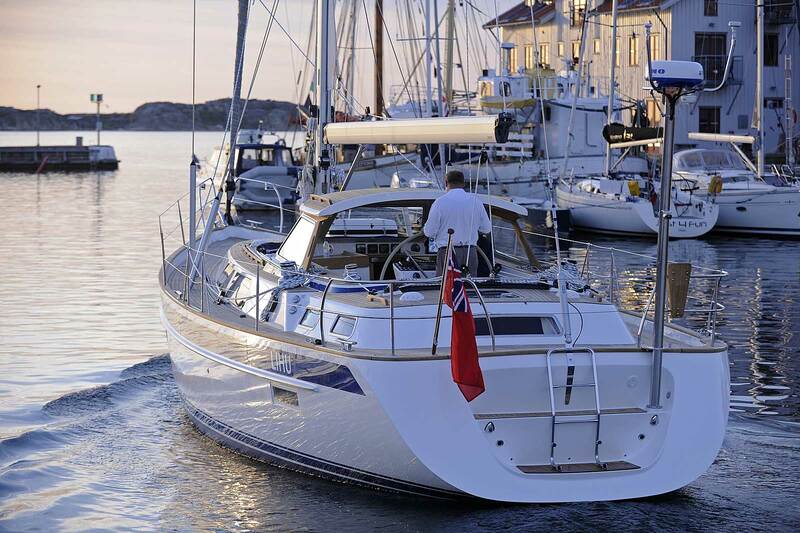 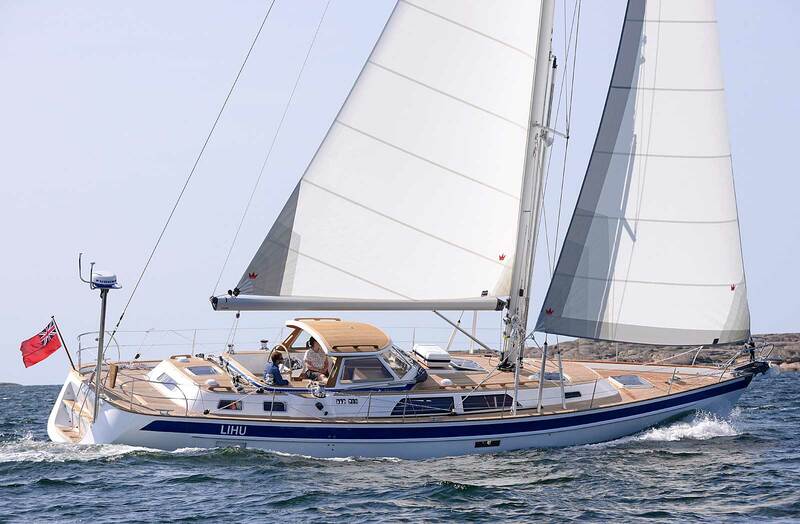 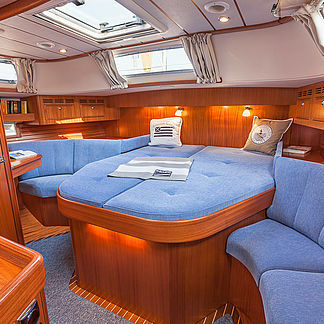 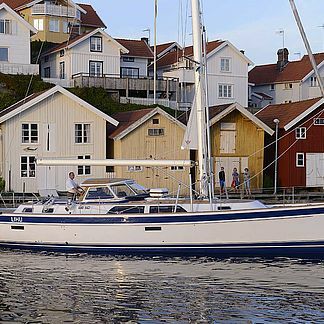 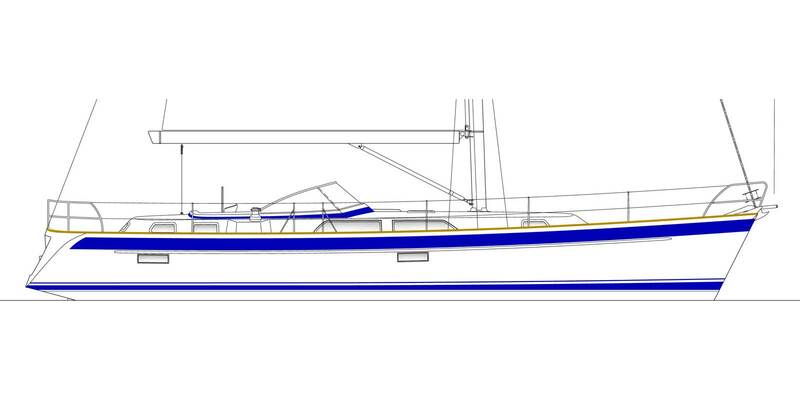 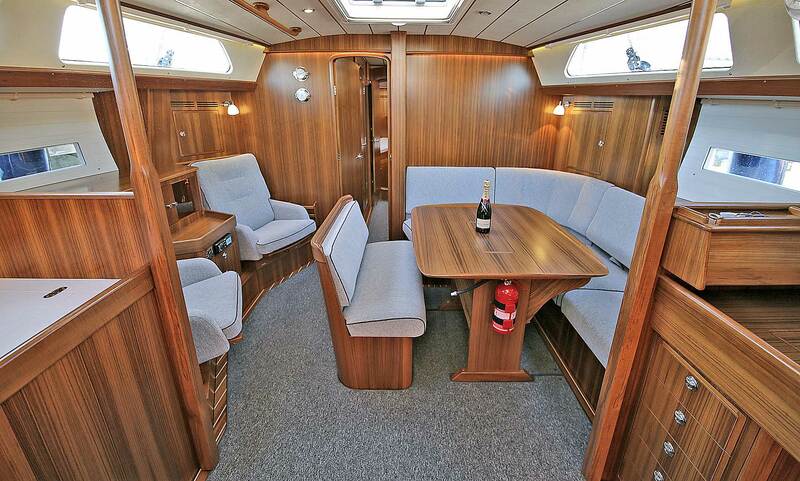 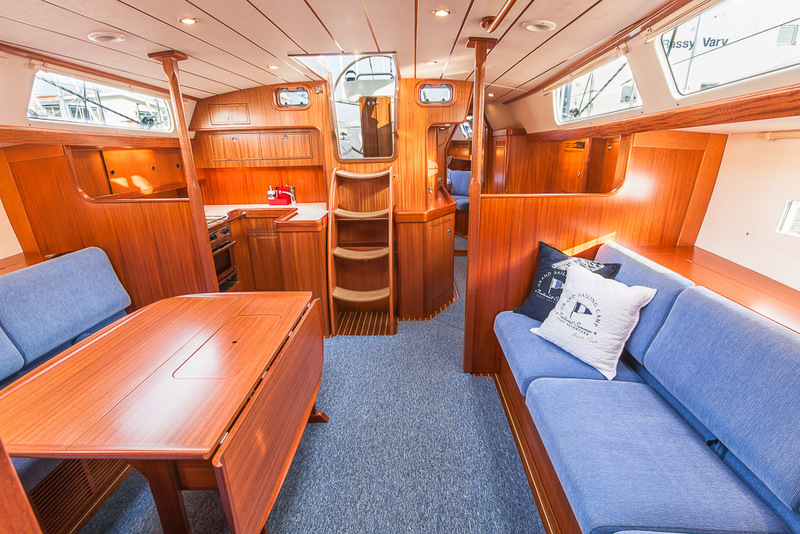 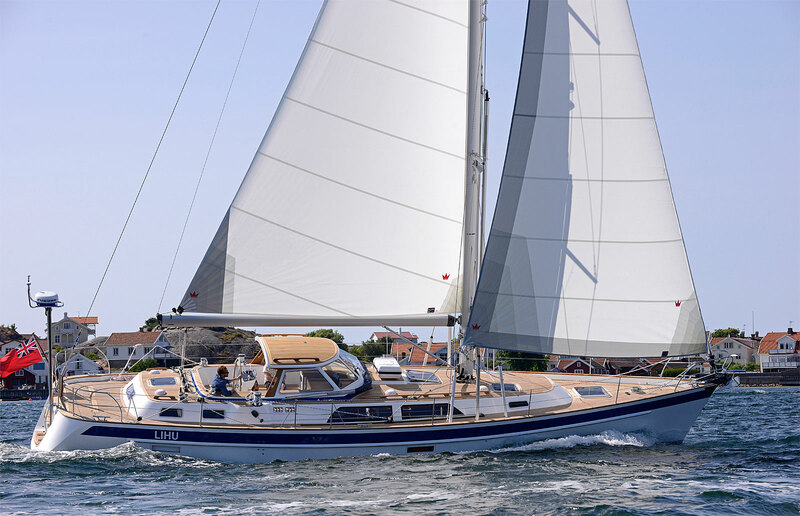 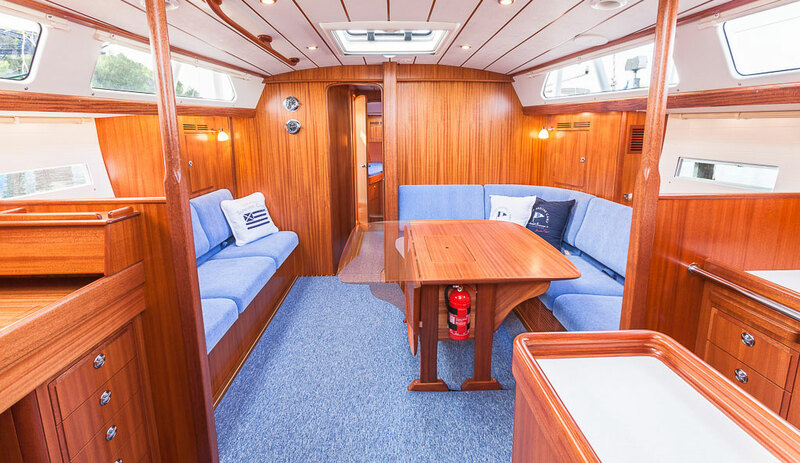 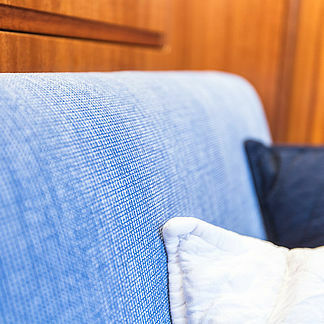 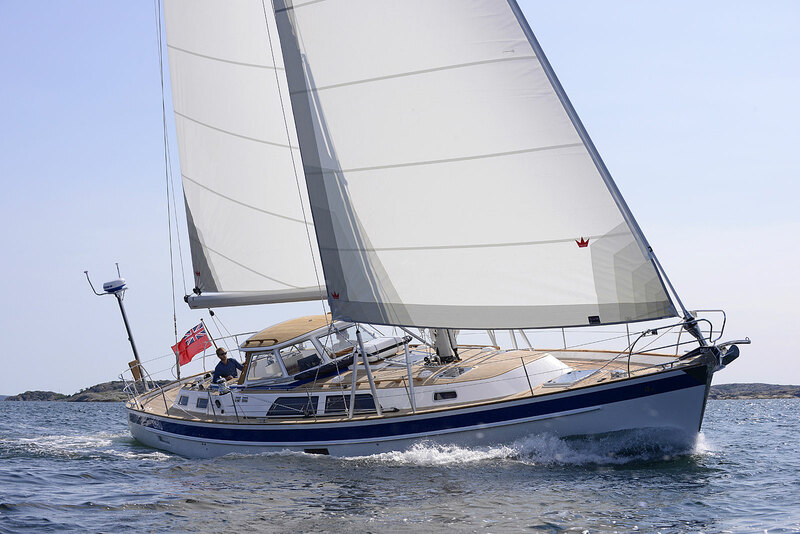 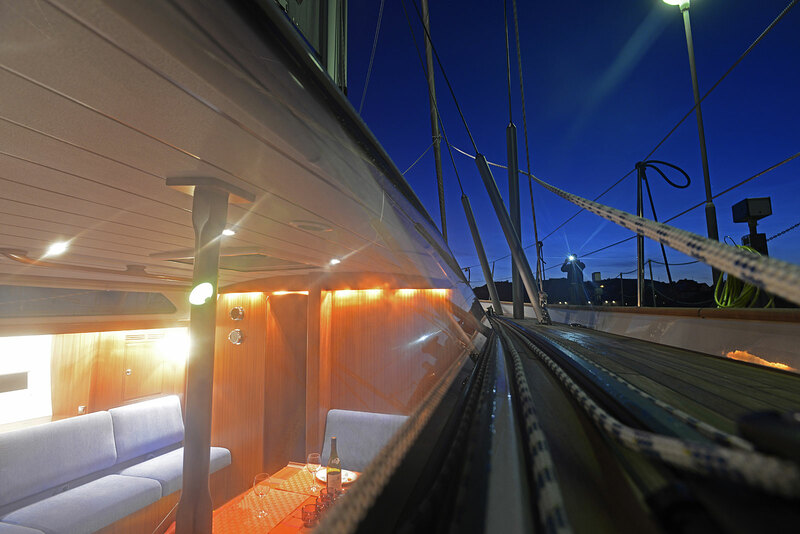 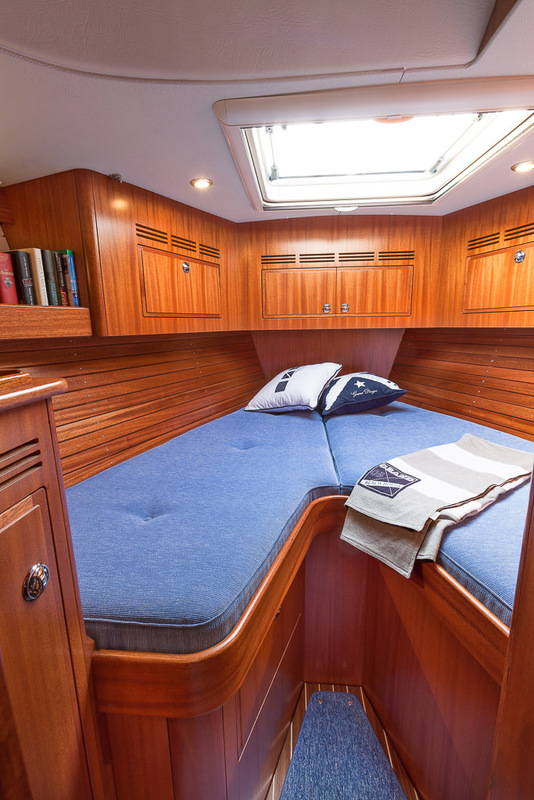 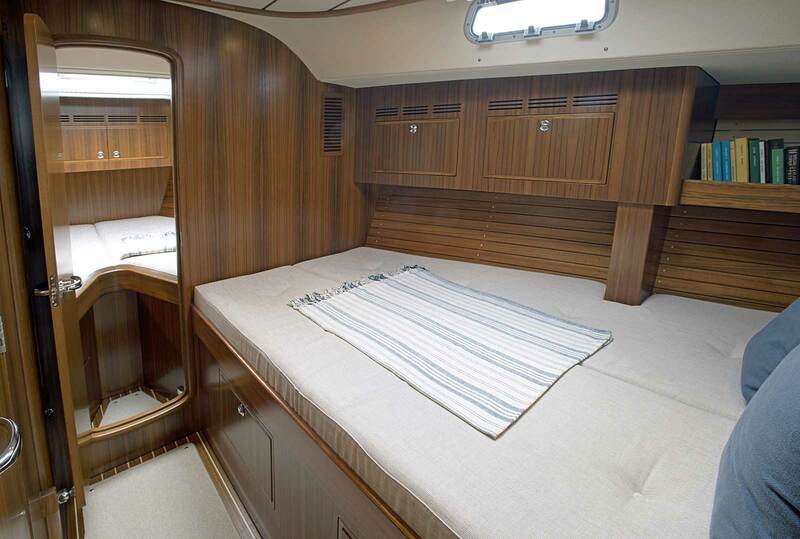 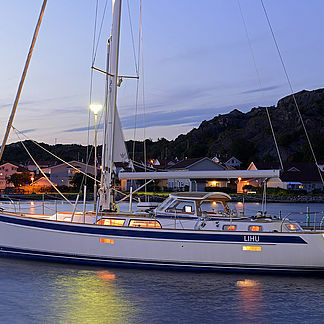 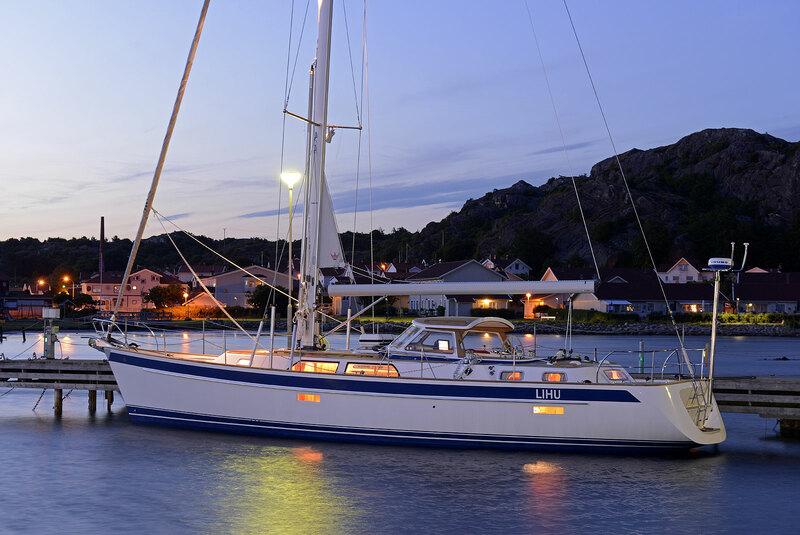 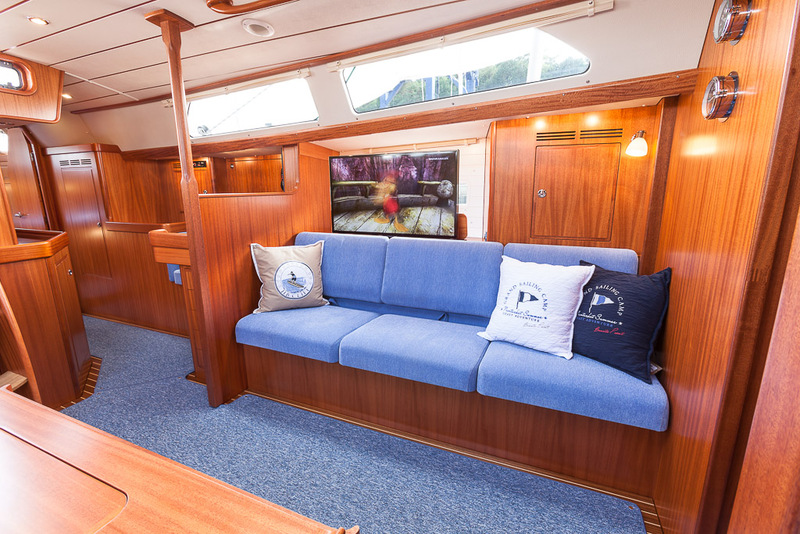 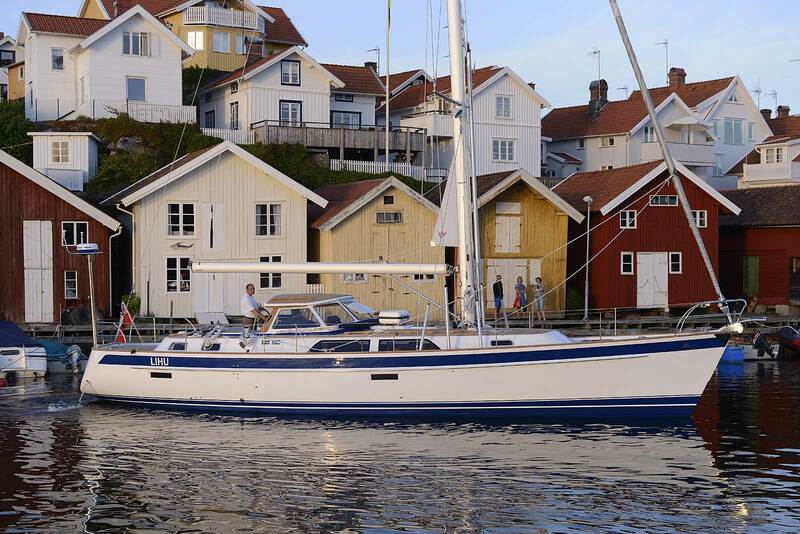 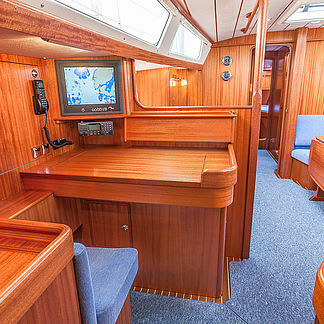 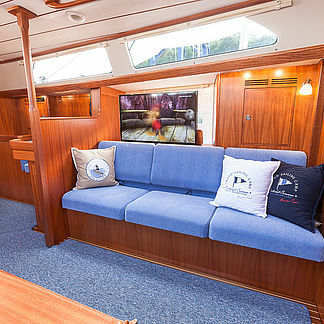 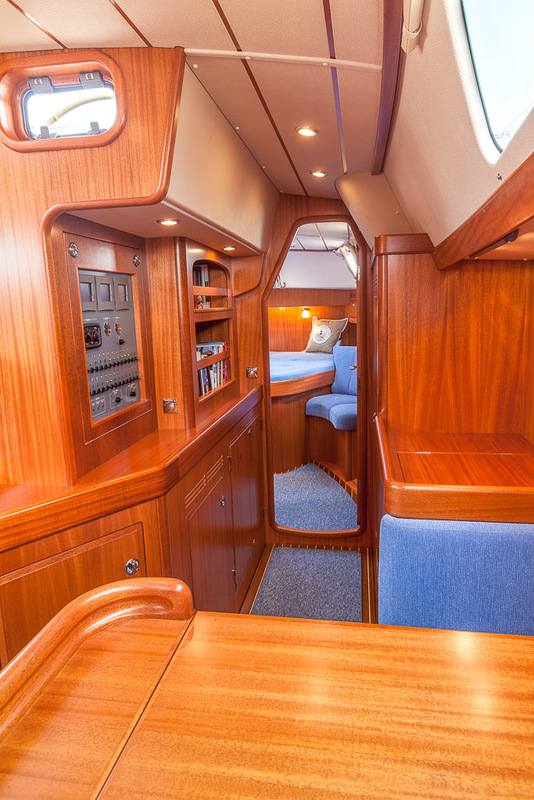 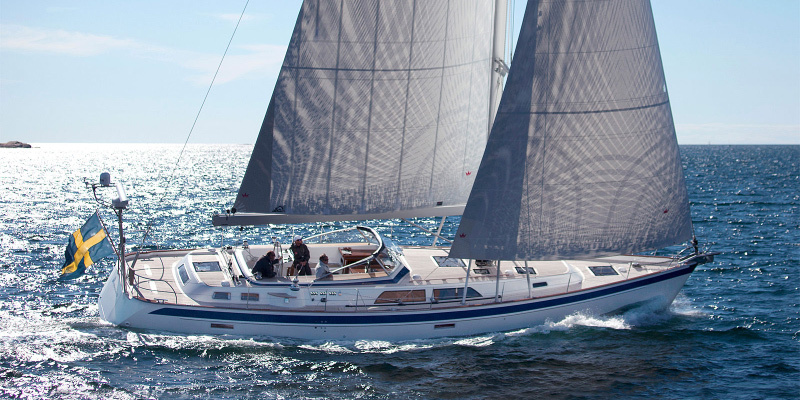 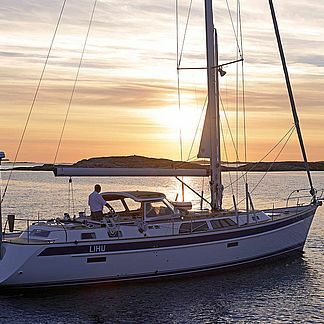 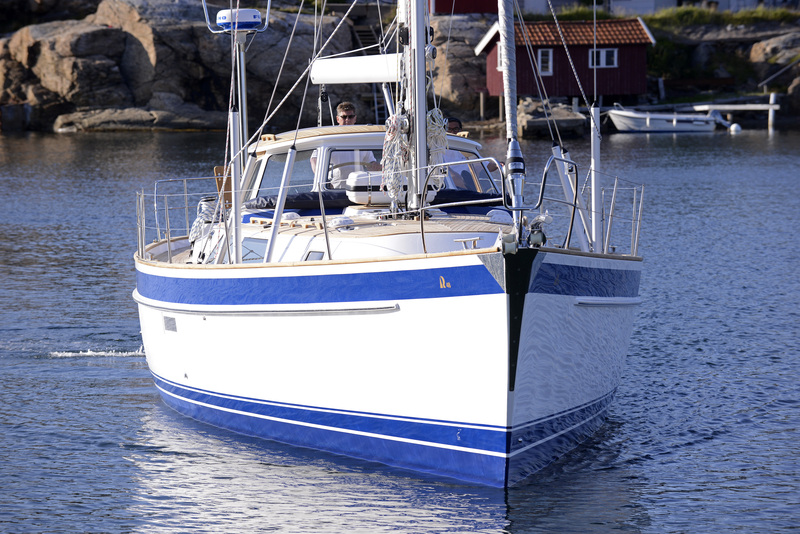 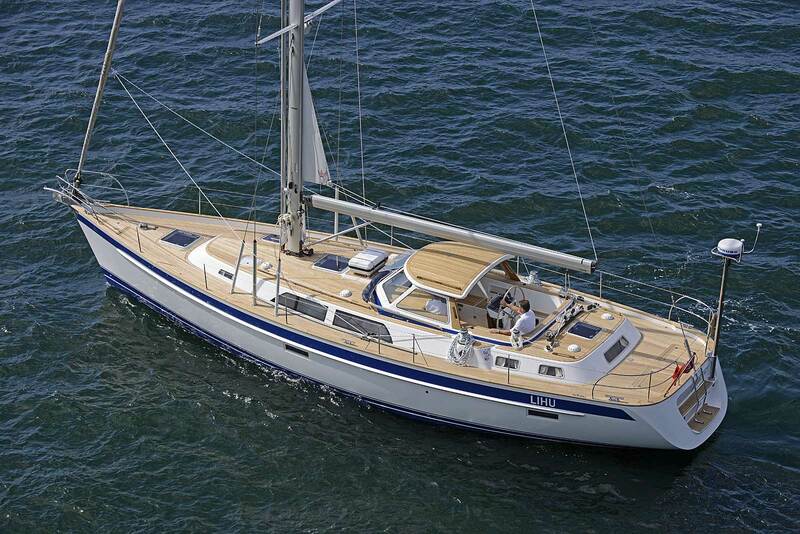 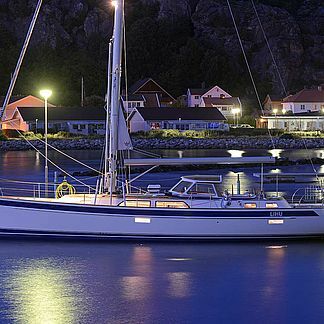 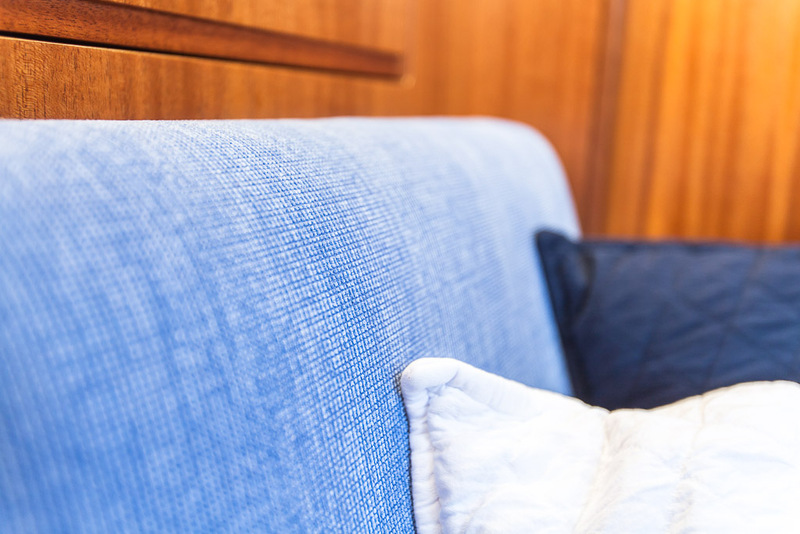 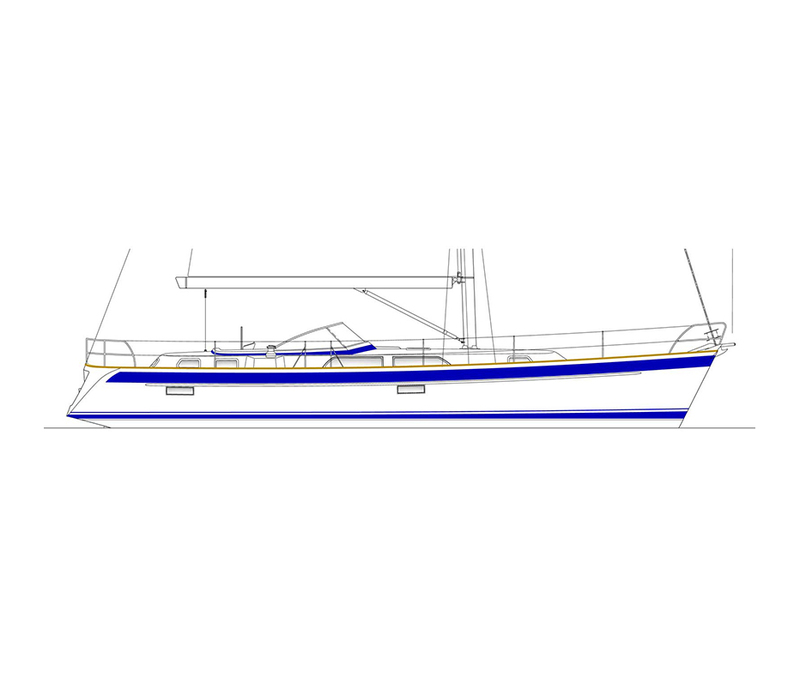 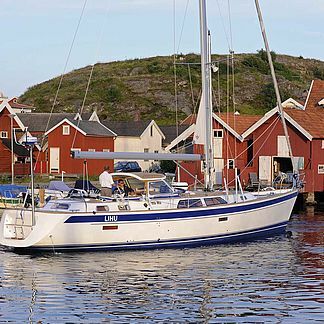 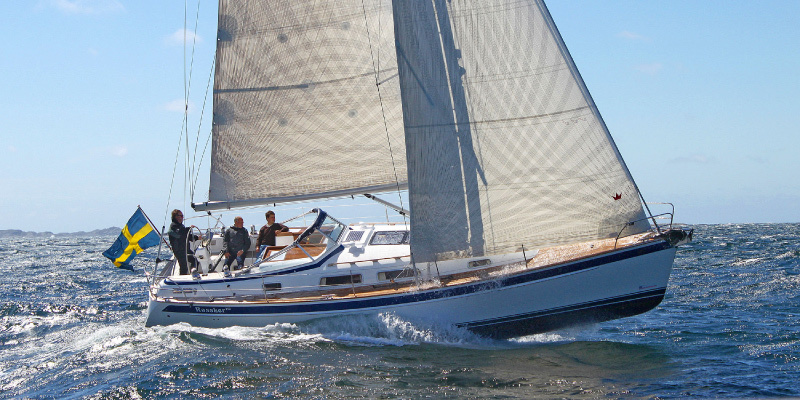 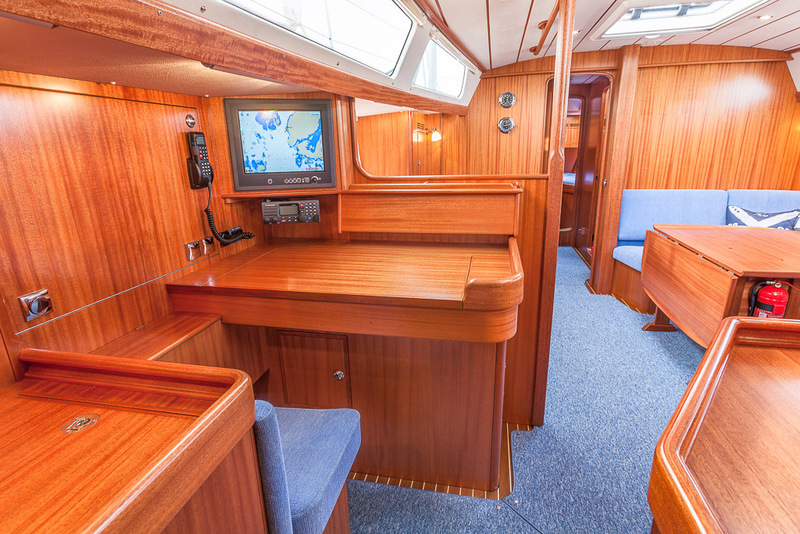 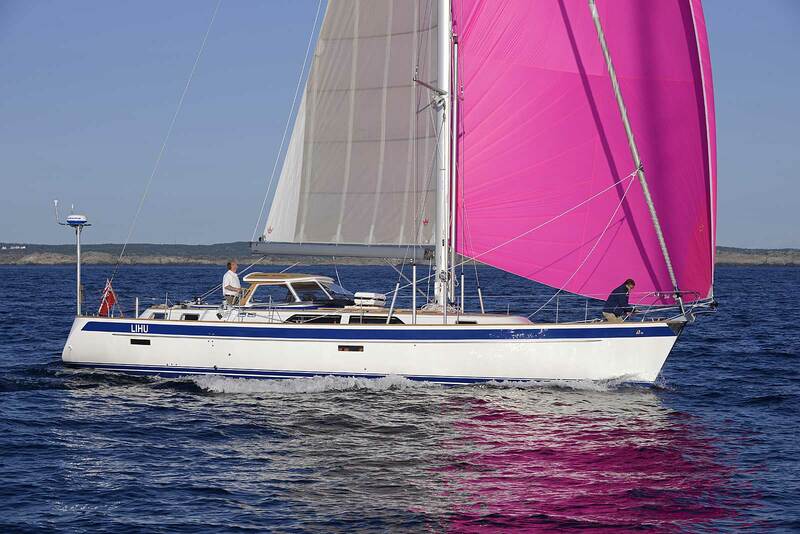 The Hallberg-Rassy 48 is a Blue Water Cruiser with three double cabins plus a vast saloon. 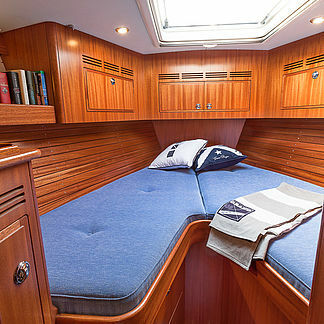 She offers great space for modern comfort aids. 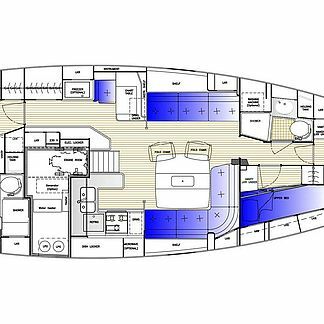 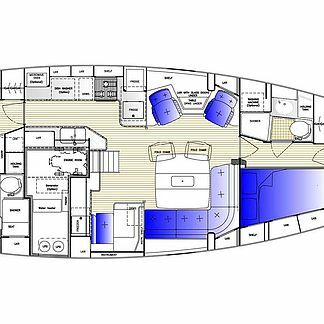 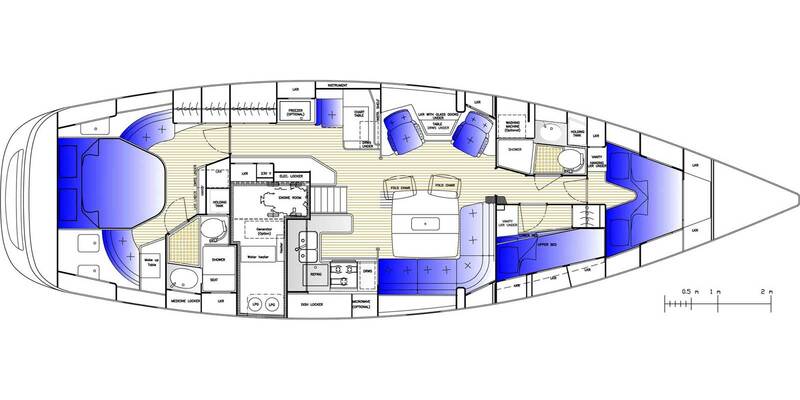 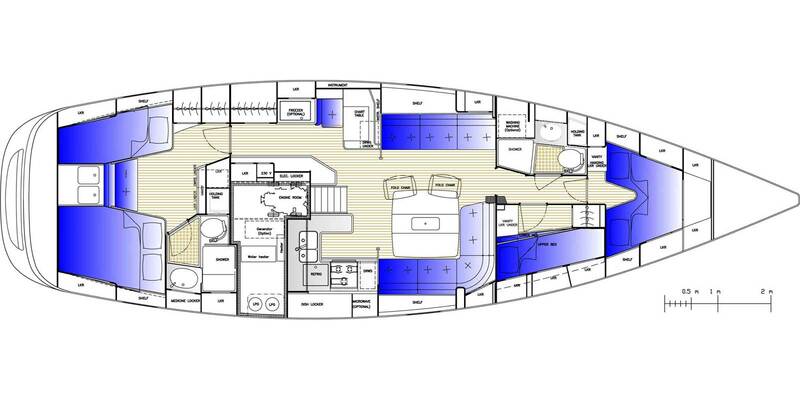 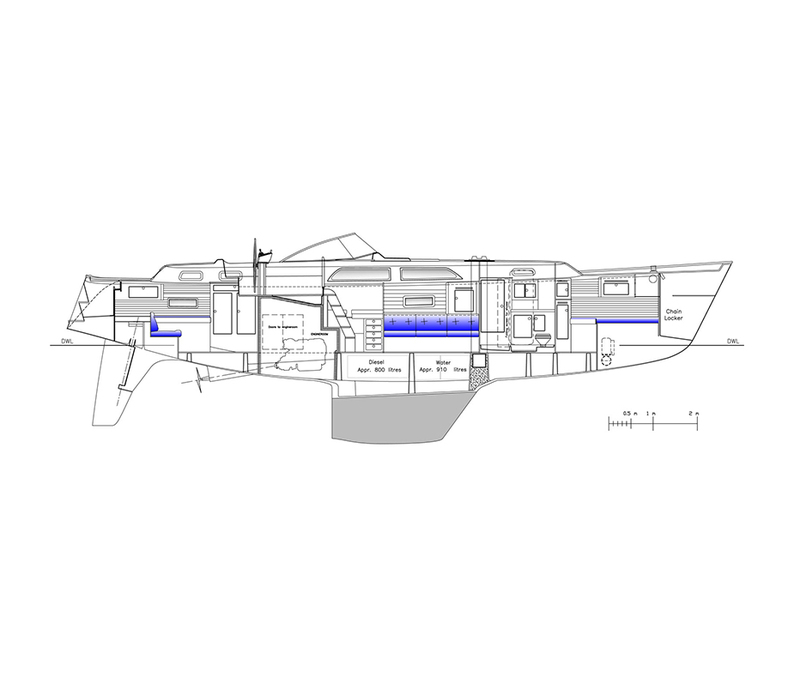 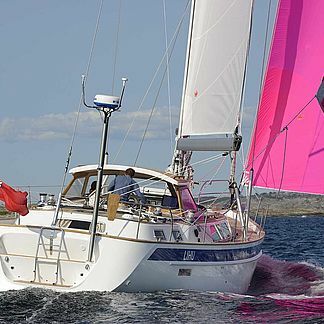 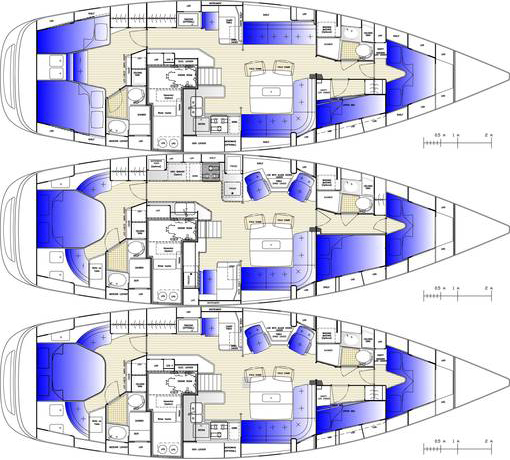 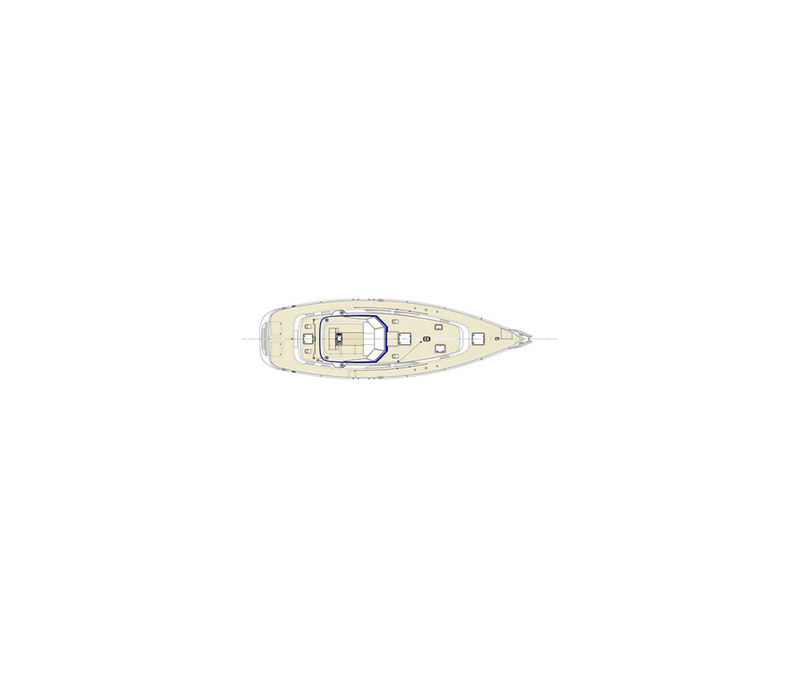 She offers a choice of linear galley or U-shaped galley, centre aft berth or two individual aft berths. 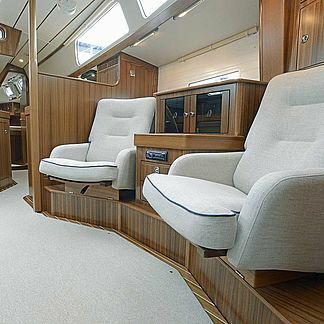 Armchairs or sofa on port side in the saloon. 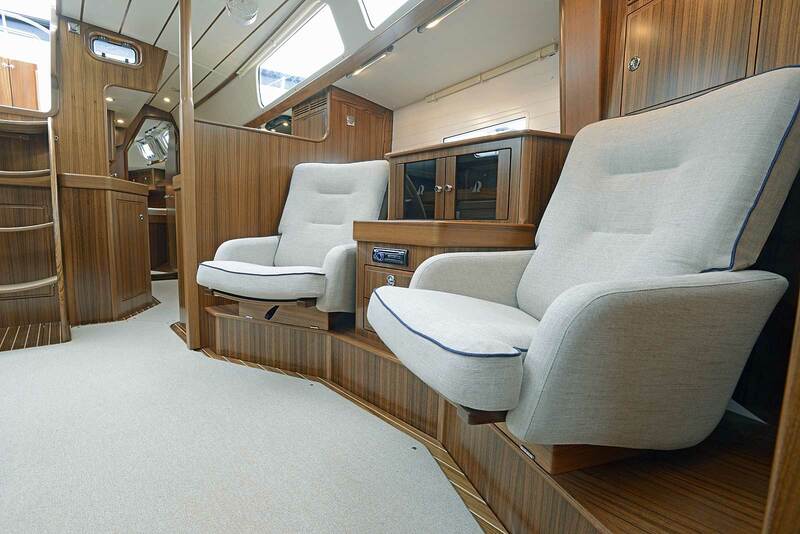 There is also a centre line sofa available in the saloon. 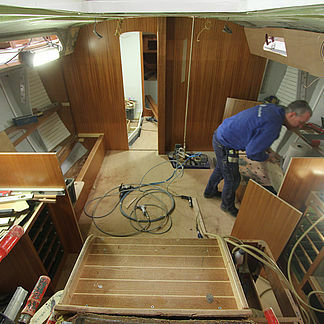 Supercabin or two cabins with walkthrough forward of the mast. 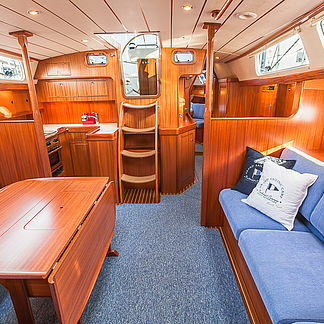 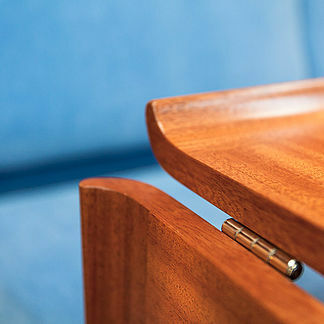 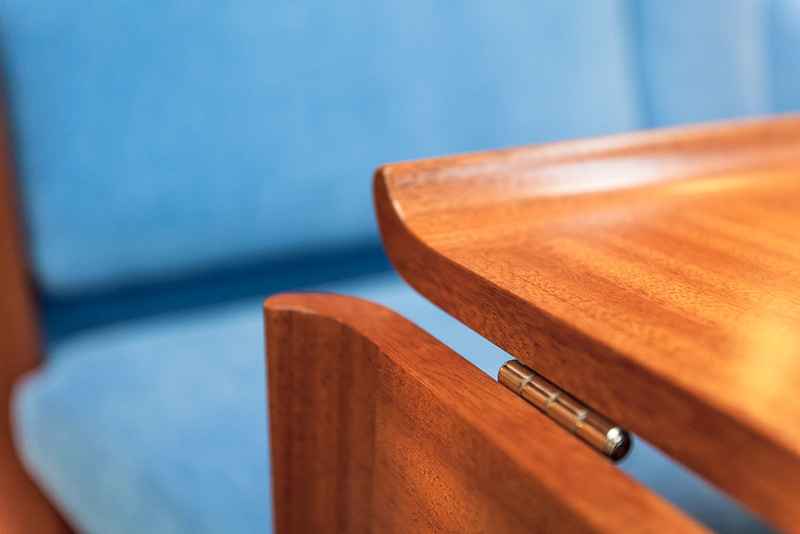 Mahogany or teak interior. 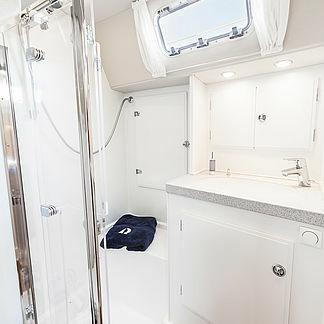 Two heads and two separate showers with plexi glass doors. 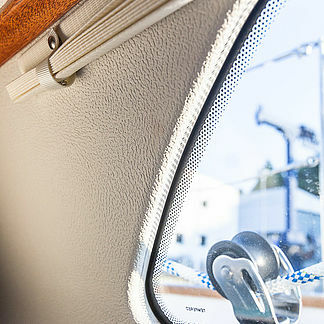 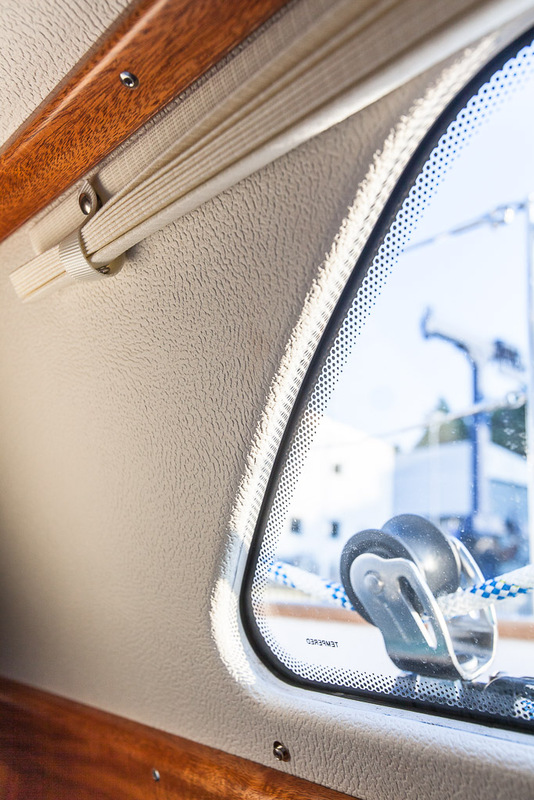 The cockpit is very well protected by a soft top or a hard top. 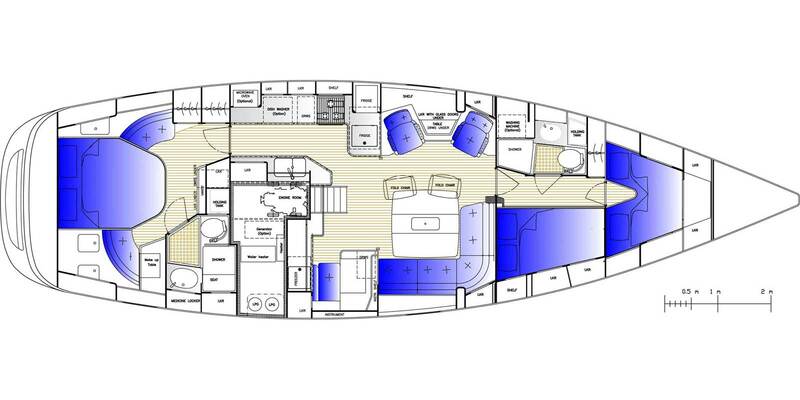 This is a yacht that will realize your Blue Water Cruising dreams. 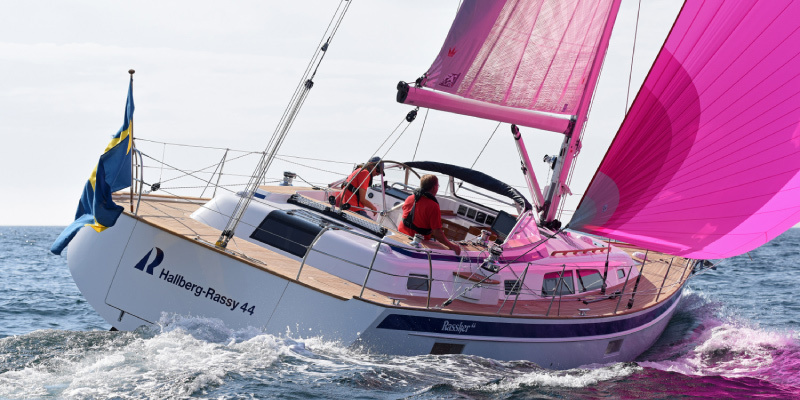 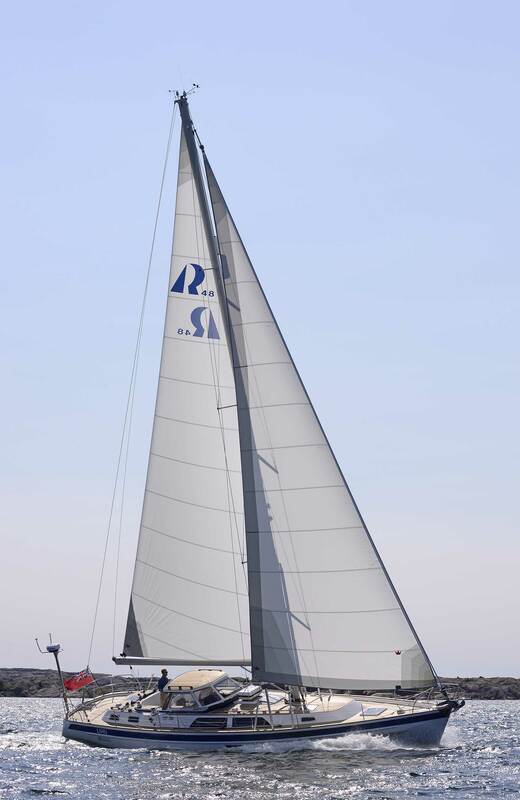 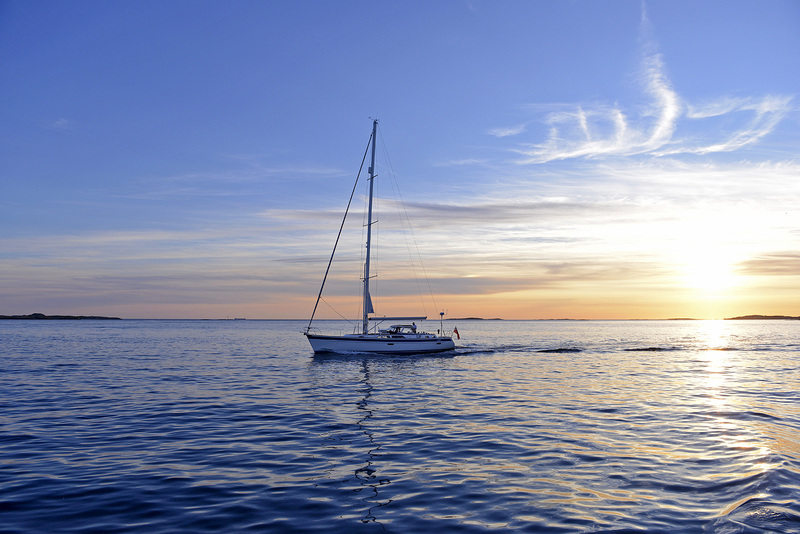 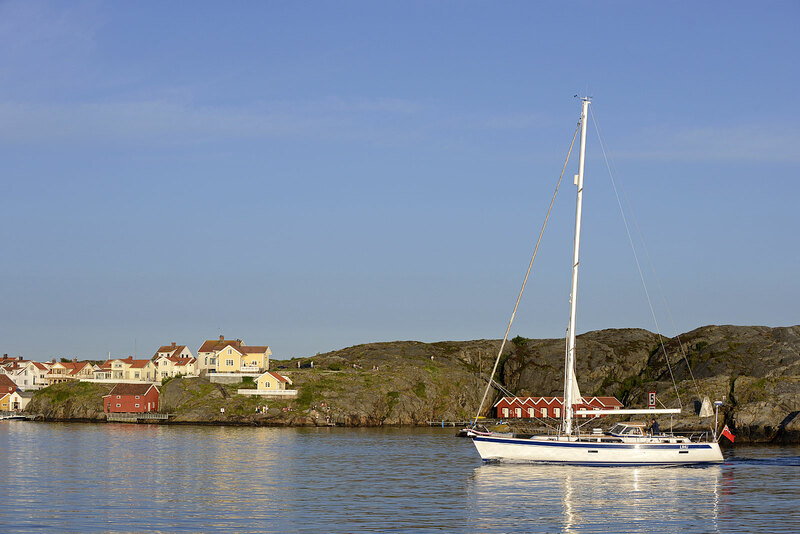 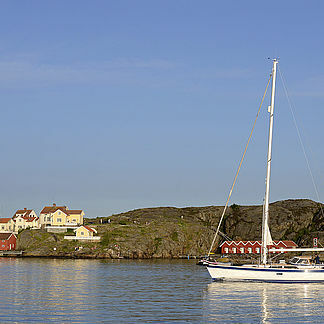 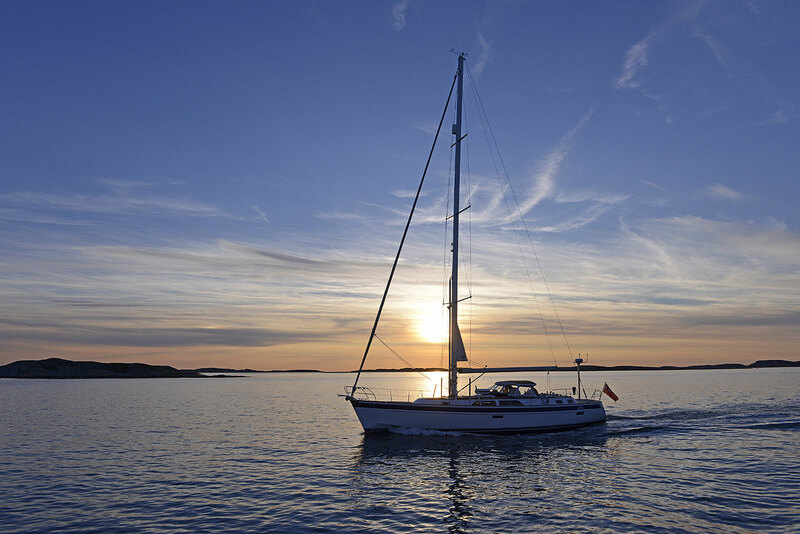 Most Hallberg-Rassy yachts are sailed by one or two couples. 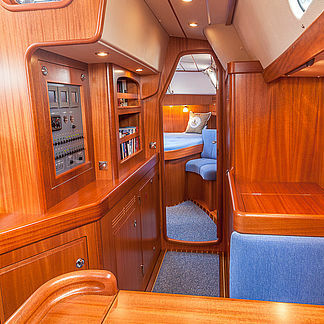 Only occasionally is there a need for a third cabin. 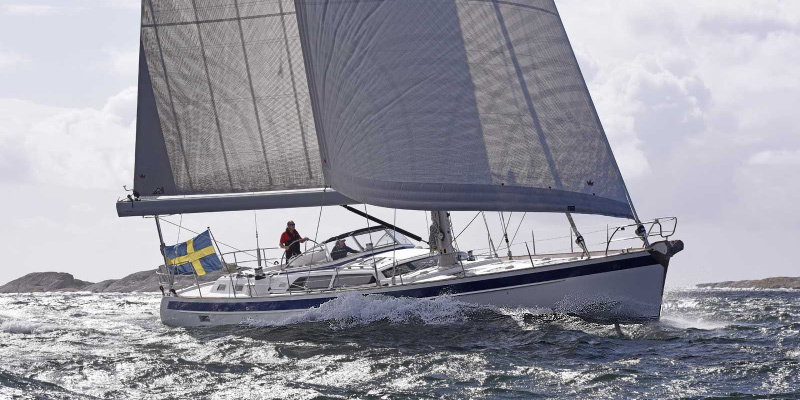 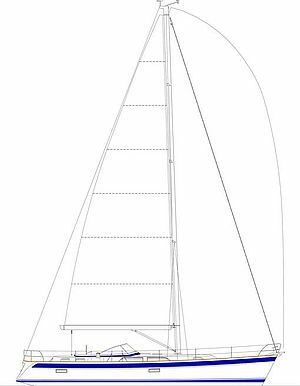 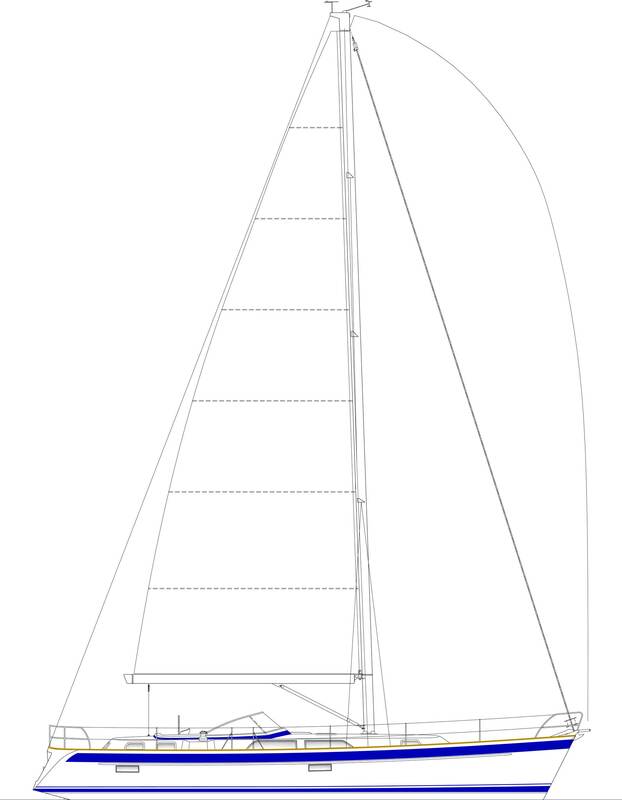 With this in mind, Hallberg-Rassy have developed the Supercabin forward of the mast. 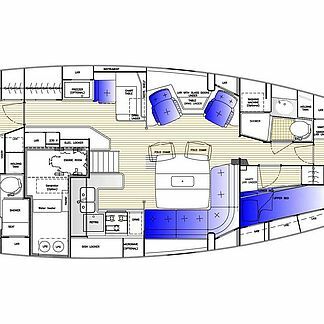 That means the yacht has two high priority double cabins and one more two-berth cabin in the front for occasional use. Apart from the comfortable aft cabin there is now also a very generous cabin in front of the mast with a double berth and lots of elbow space. 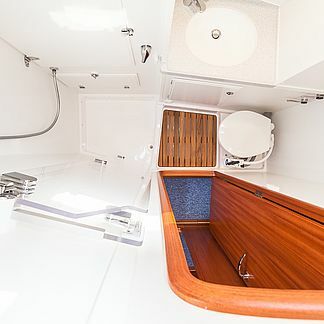 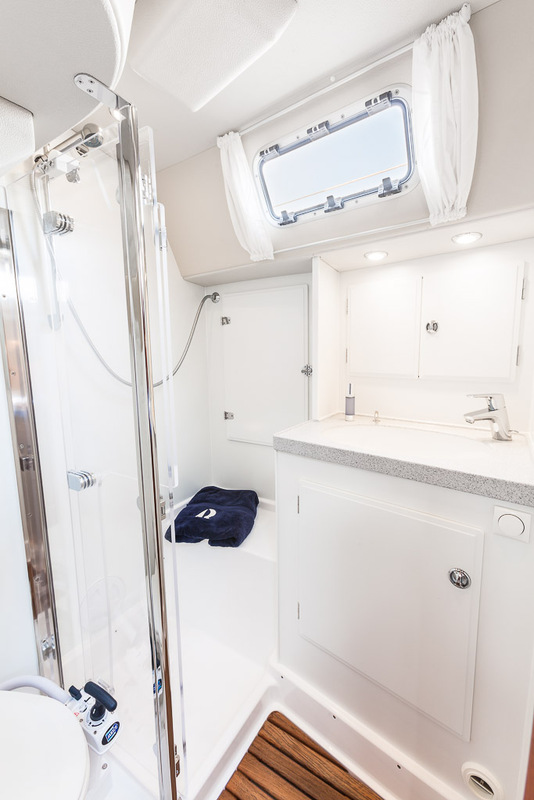 The V-cabin in front is still there and the actual berths are not smaller than they normally are but the hanging locker and the floor area of the V-cabin has been reduced in favour for the super cabin forward of the mast. 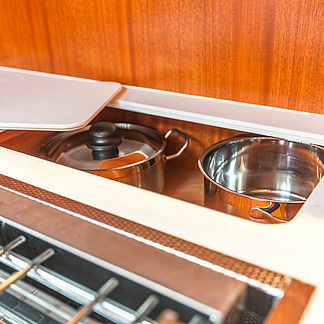 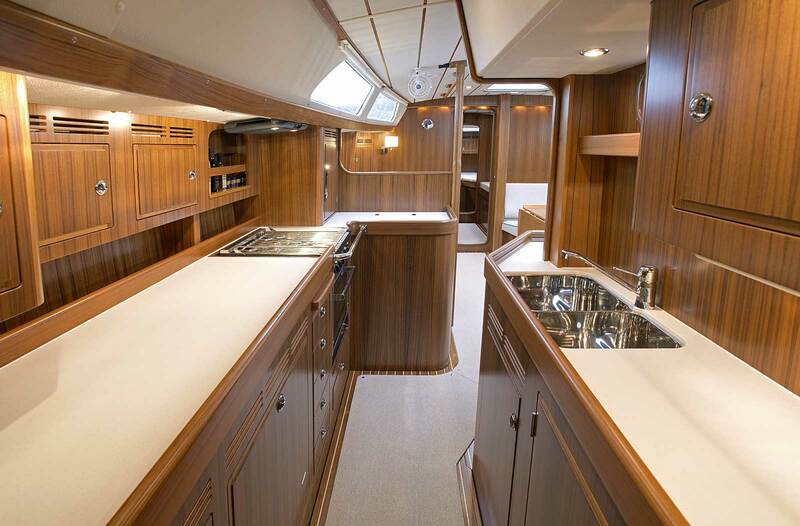 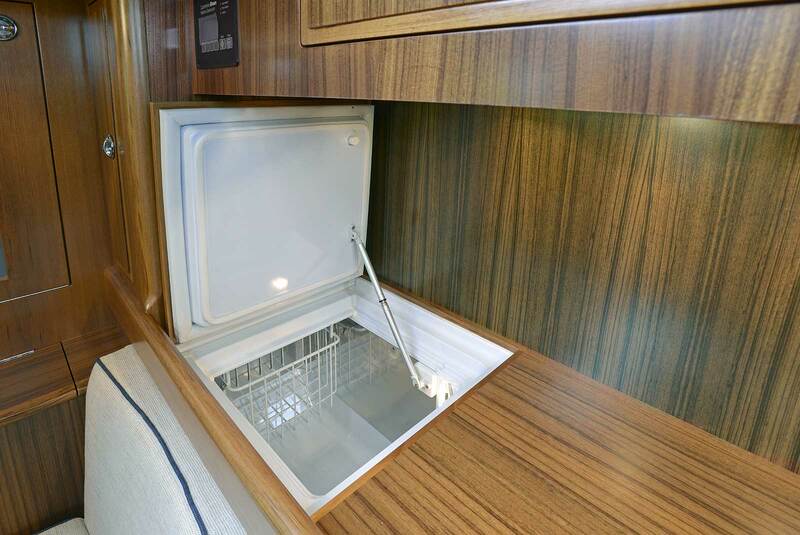 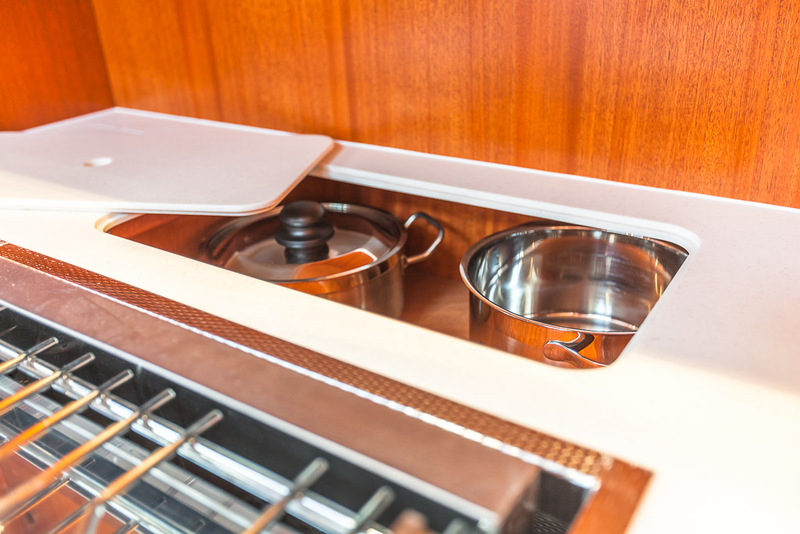 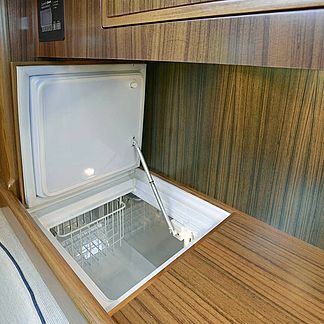 The linear galley configuration is offered on port side with more worktop area and an additional fridge that is front opening. 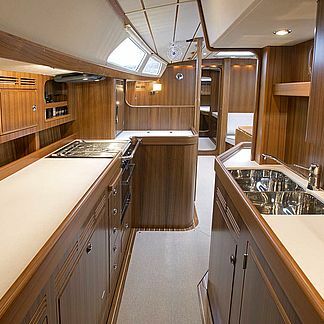 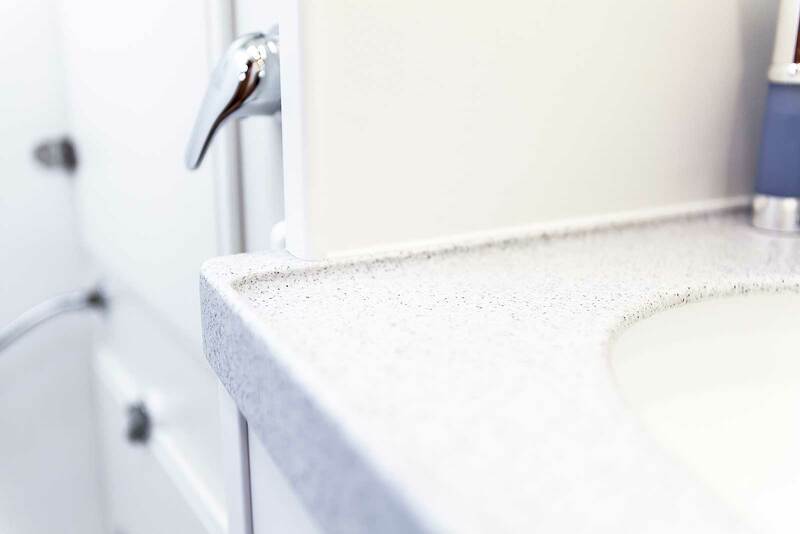 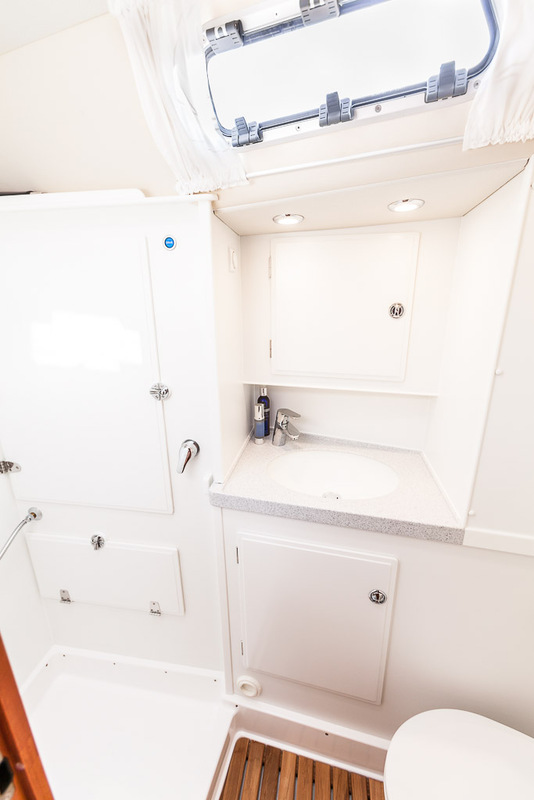 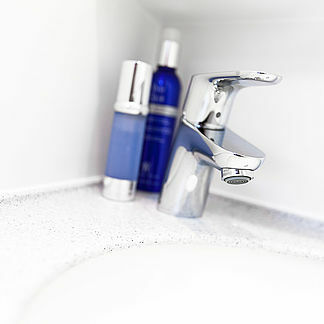 The linear galley also gives the opportunity for two people to work in the galley simultaneously. 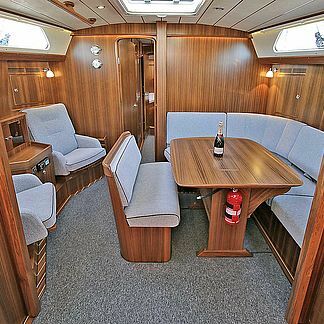 The alternative with the galley to starboard has its advantages. 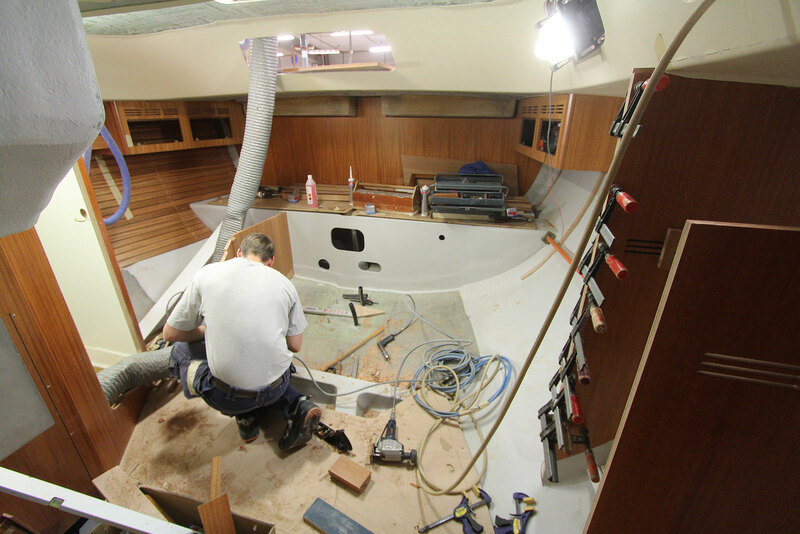 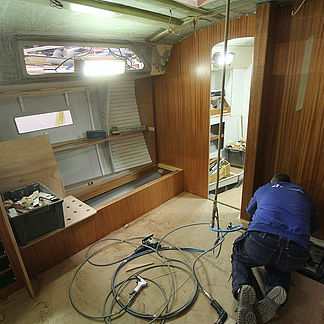 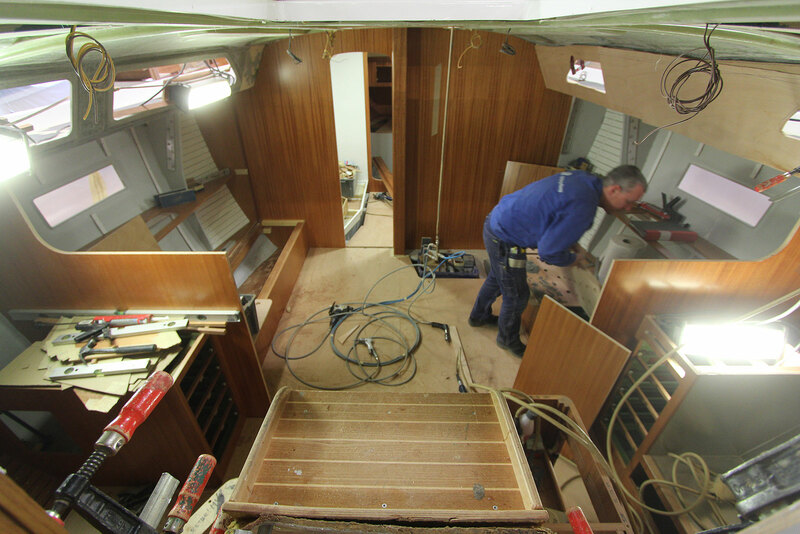 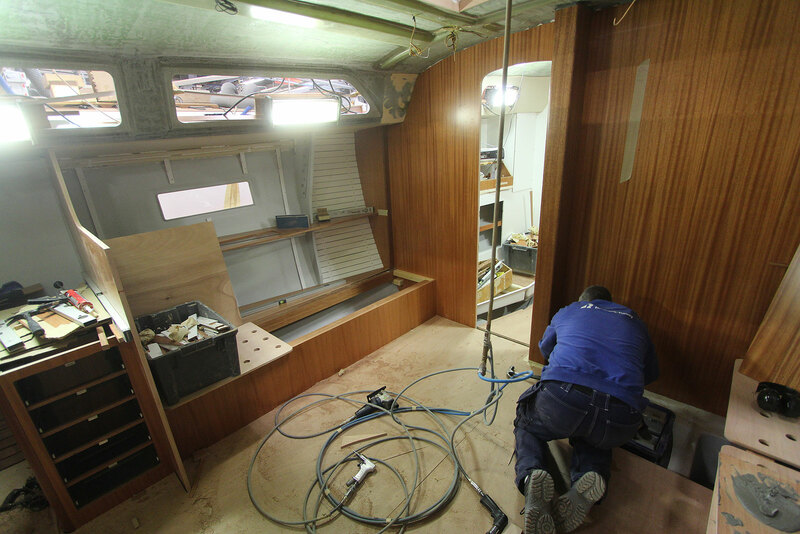 The one who works in the galley doesn't obstruct the natural flow through the boat, for example into the aft cabin. 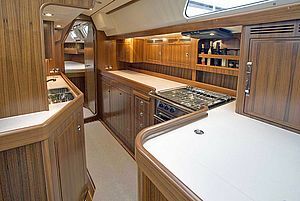 The person working in the galley has good contact with the people in the cockpit, as well as to the saloon. 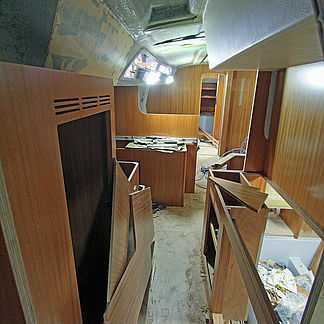 The lockers are wider than with the port side galley. 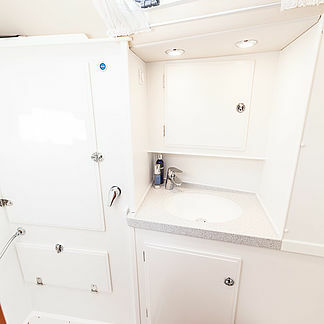 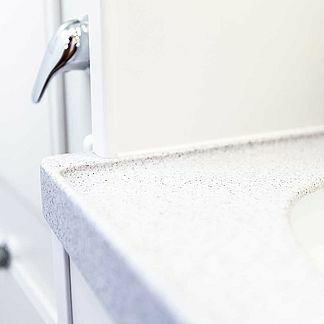 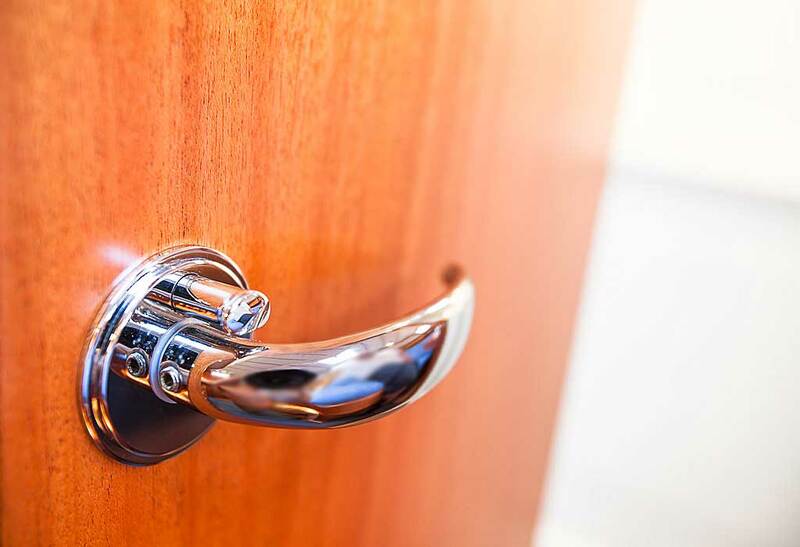 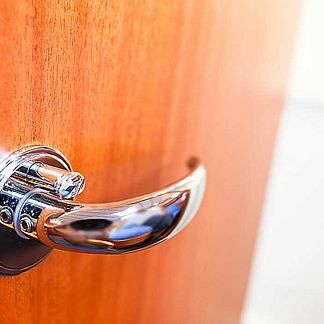 You may safely open the lockers above the sinks on any tack. 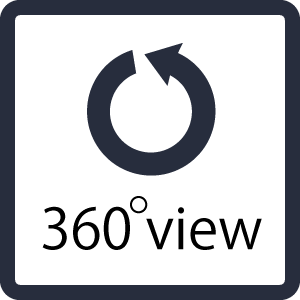 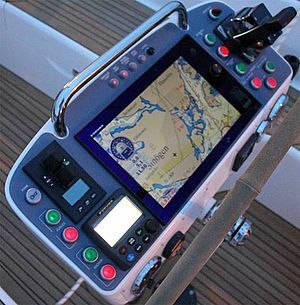 You are optionally able to push button operate all essential functions such as furling mainsail in and out, genoa, cuttersail, backstay tensioner and vang from the steering stand. 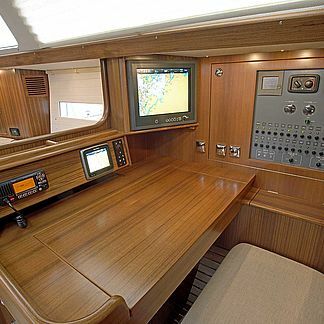 There is space for a 14 inch plotter. 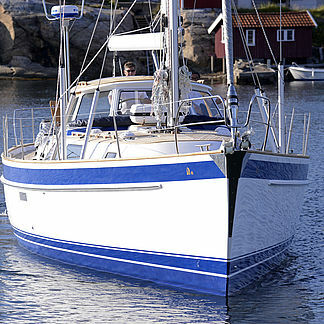 The genoa sheet winches may be ordered both forward- as well as backwinding. 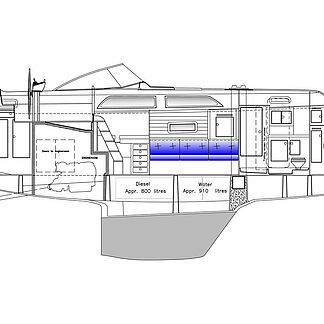 There are retractable bow- and stern thrusters available. 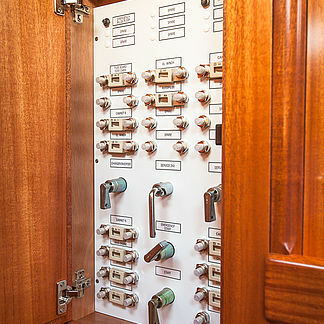 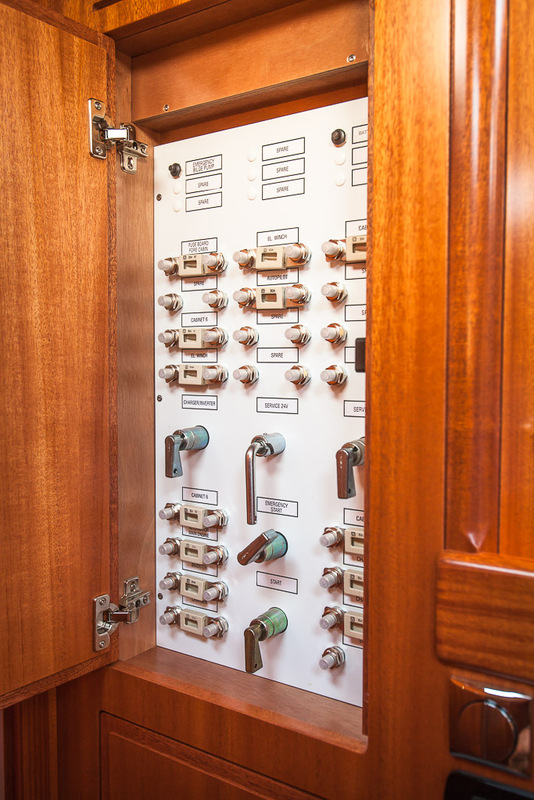 Push button operation makes it possible to handle a big yacht like this with minimum crew. 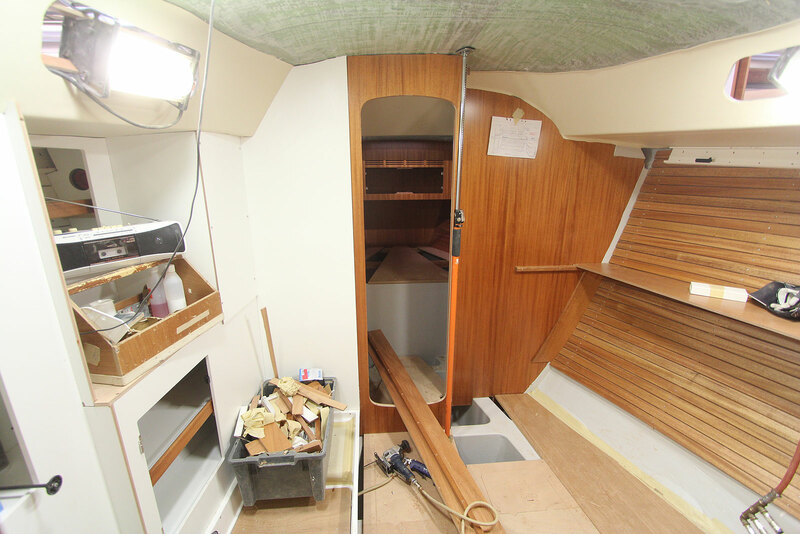 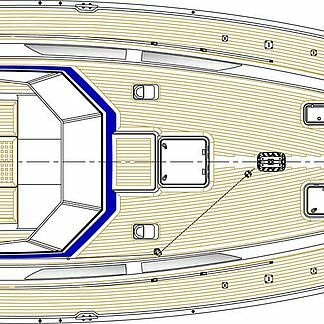 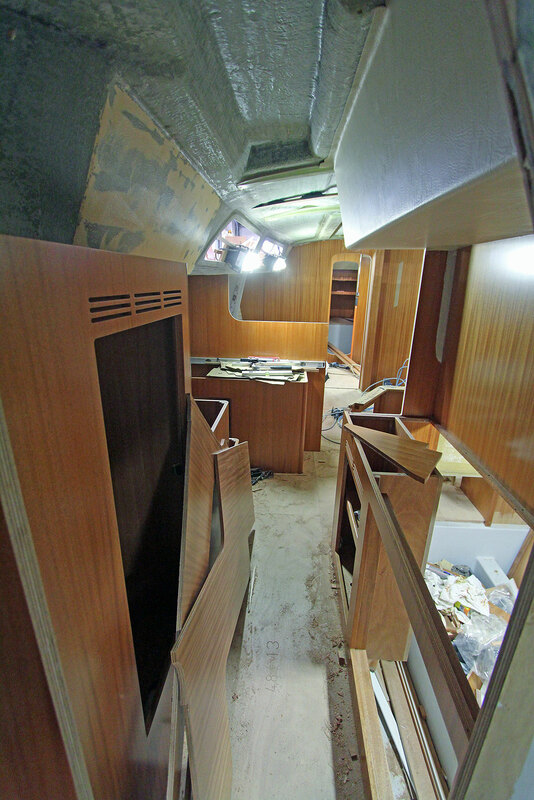 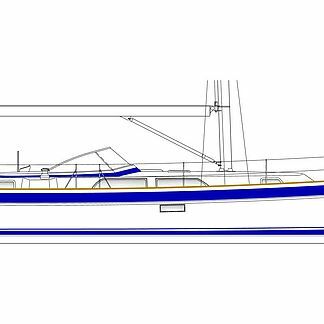 To see a 360 degrees virtual reality view of the Hallberg-Rassy 48 Mk II saloon, with teak interior and linear galley to port, please follow this link. 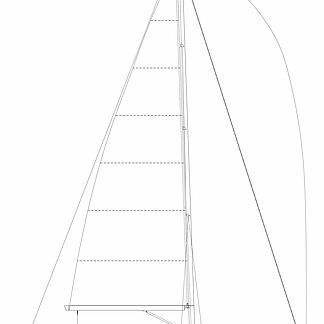 14.99 m / 49' 2"
13.25 m / 43' 5"
4.50 m / 14' 9"
21.75 m / 71' 4"
1.99 m / 6' 6"
4.78 m / 15' 9"
4.35 m / 14' 3"